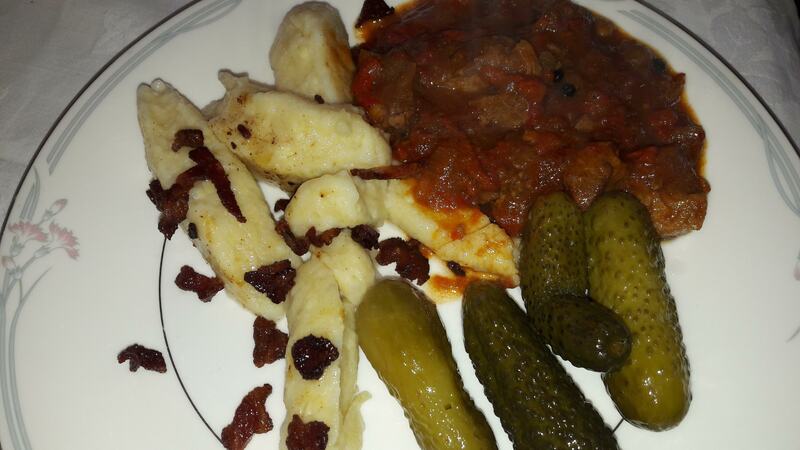 This is a new recipe for me – it is from the South West of Poland, the area called Śląsk – Silesia in English. Pyrus communis is the European pear. Pears originated in the Caucasus and then spread to Asia and Ancient Persia and from there to Europe. Pears have been cultivated for over 4,000 years. Pears are more demanding than apples and so you will find that there are more pear orchards in Southern Poland where there is more sun and because of the fertile soil. Conference is a a popular cultivated variety in England. It was cultivated by Thomas Francis Rivers and it won 1st prize in 1885 National British Pear Conference in London. It is also popular and grown in Poland now where it is called Konferencja. 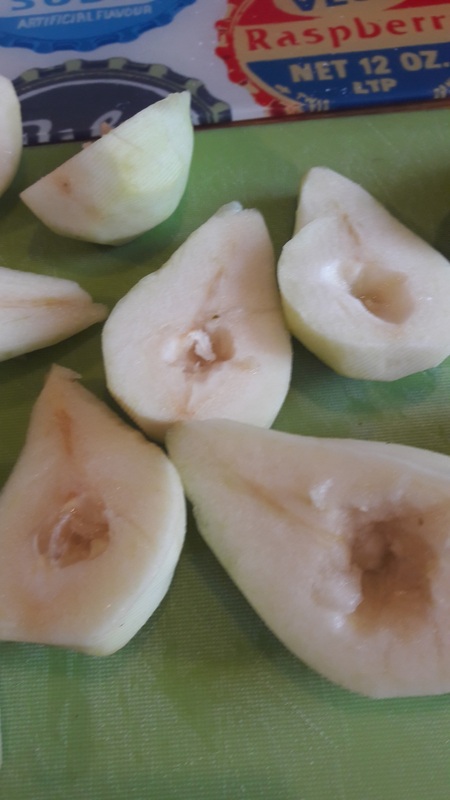 This is a good pear for this recipe as it need to be a hard pear that keeps its shape and does not disintegrate. 400g – 500g of shoulder pork – in slices. 1 -2 tablespoons of plain flour. Allspice also called pimenta or Jamaican pepper is very popular in Polish cookery. It is the dried unripe berry of Pimenta dioica, a tree native to the Greater Antilles, southern Mexico and Central America. The name allspice was coined as early as 1621 by the English, who thought it combined the flavour of cinnamon, nutmeg and cloves. Until recently it seemed to have fallen out of favour in England though now it seems to be being used more and more. In Poland it is used with meats as well as or instead of peppercorns and is used in cakes. I have been able to obtain it a lot more readily in the past few years and am now using it a great deal especially in casseroles as I love the taste. Peel & chop the parsnip and carrot into rough cubes. Fry the all gently together and put them at the bottom of a the casserole dish. Lightly dust the pork and fry gently in sunflower oil. Add the pork on top of the vegetables. Pour in the stock & put on the lid. Place in the oven and cook for 1 hour – then turn the oven down to GM3 – 160°C and cook for another 2 hours. 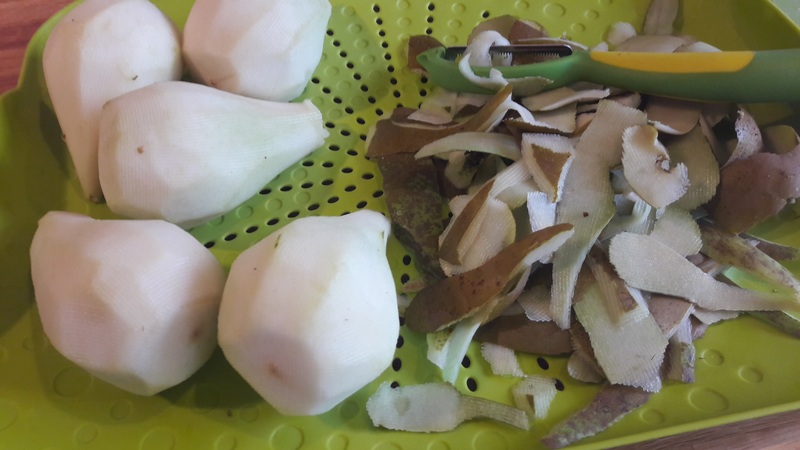 Peel the pears and cut then in half and remove core & pips. Place the pears on top of the meat & cover with the lid. Cook for around 20 – 30 minutes until the pears are tender. 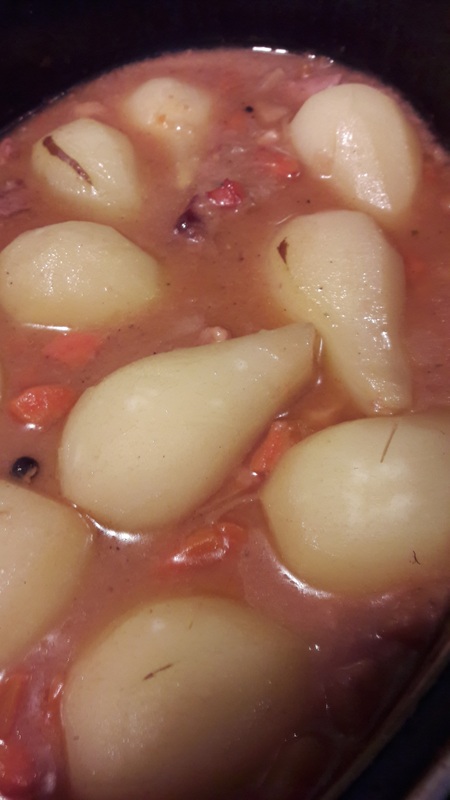 You can make this in advance with just the vegetables and pork and then re-heat it at GM4 – 180°C – for around an hour and then add the pears. Dried pears are often used rather than fresh – drying fruit is a very popular method of fruit preservation in Poland & means that this recipe could be made in the winter when all the fresh fruit was no longer available. Dried Pears are for sale in the fruit and nut stall In Kirkstall Market in Leeds. You have to reconstitute the pears – this is best done overnight. 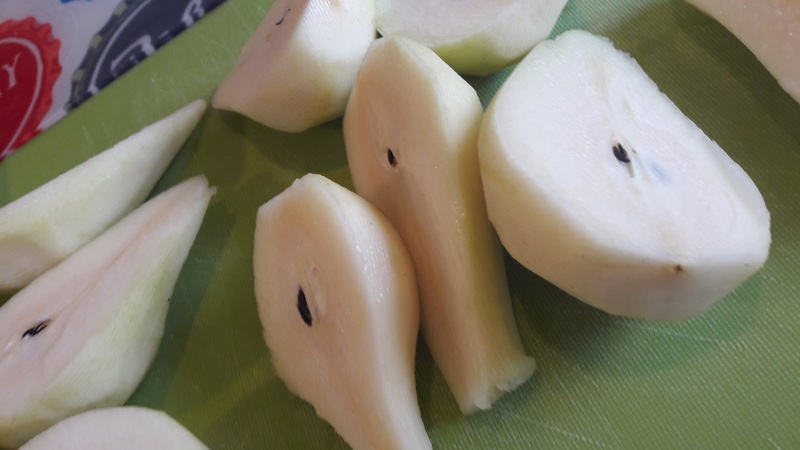 Place the pears in a dish and pour hot weak black tea over the pears and leave them or you can use just hot boiled water – I think the pears with tea taste better. 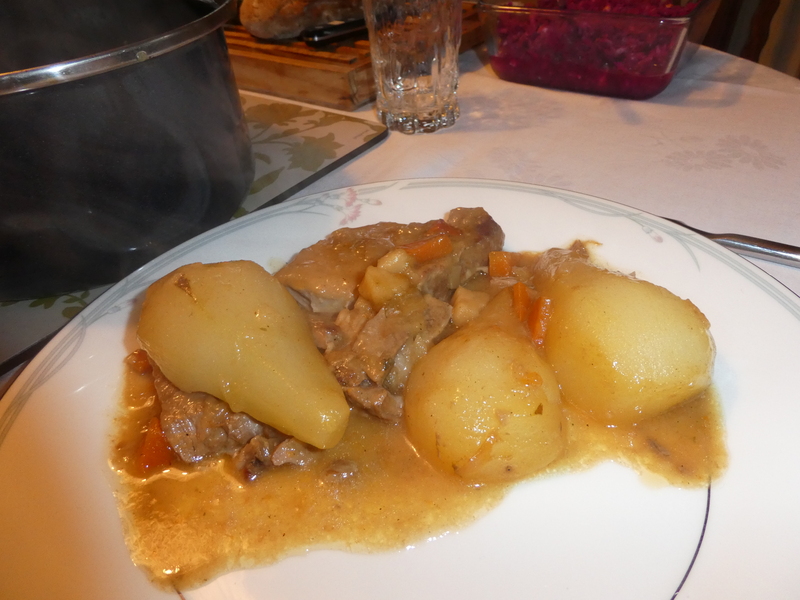 Cook the meat as before and after you have added the re-constituted pears cook the dish for another 30 – 35 minutes. Fry some slices of pork loin on both sides in a mixture of oil and butter in a deep frying pan. Add the reconstituted pears about 3 per piece of meat with some of the liquid. 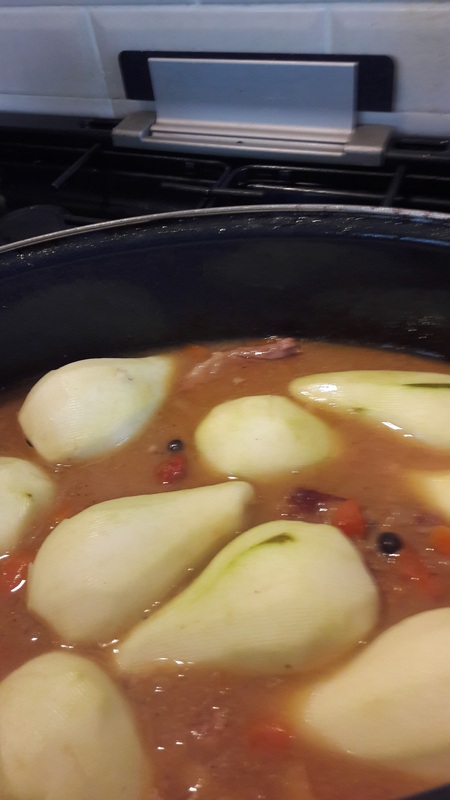 Cover the pans with a tight fitting lid (good to have a glass one to see what is happening – as it is easy for this to burn because of the sugar in the pears & liquid) and simmer for 25 -30 minutes. One of my books said these went very well with dumplings from Śląsk (Silesia in English) – these I will have to investigate for a later post next year. In many recipe books and often on menus in restaurants you can see dishes described as po staropolsku which means in an Old Polish Style. I have found this a hard question to answer as there two sides to its meaning, one is about hospitality and the other is the ingredients. When restaurants use po staropolsku they are trying to evoke connections to noblemen & democracy with the chivalry & hospitality that was found in the manor houses in Poland, particularly from the 16th to the 18th century. They are trying to make you think of the quality of the food and the surroundings. The Poles are thought to be a very hospitable nation and a very famous saying in Poland is – “Gość w dom, Bóg w dom” which means when you have a guest in your house, you have God in your house, meaning treat your guests to the very best. “Lepiej gościa zabić, niż nie nakarmić “which means – it is better to kill a guest rather than not feed them well. I noted this quote many months ago – today when I tried to find the reference in the book, which is a large tome of over 900 pages, I could not find it – when I do in the future I will come back and add it here. Some of my reference cookery books. Dishes included various soups & especially Sour Soups (I will write about these in the future), honey cakes, pierogi, gołąbki, bigos and dishes with meat & dried fruits. Some of my favourite dishes in the old Polish style combine pork with prunes, often with honey. I love the flavour of the meat with all this sweetness added to it. 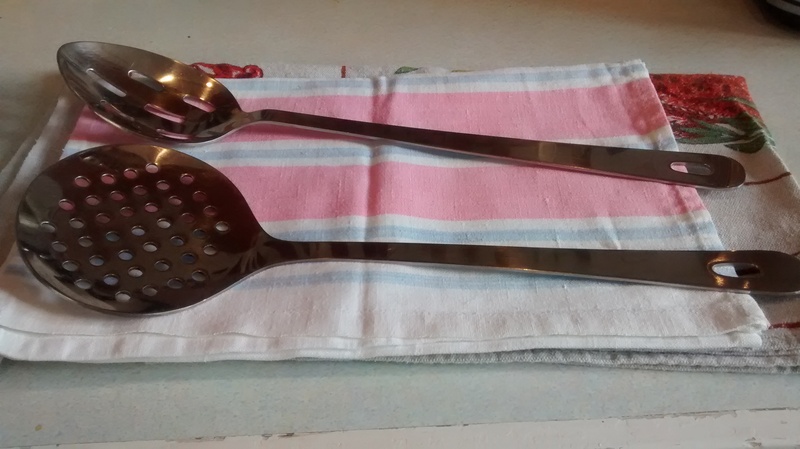 I am going to write up 3 different recipes – the first in this post – the others to follow shortly. The best pork to use is a boneless joint of pork loin which has also had the skin removed, but if you cannot get this then leg of pork is good as well. When roasting pork allow 50 minutes per kilo, plus 25 minutes at Gas mark 5 – 1900C. Note You can always scale up this recipe for a larger piece of pork. 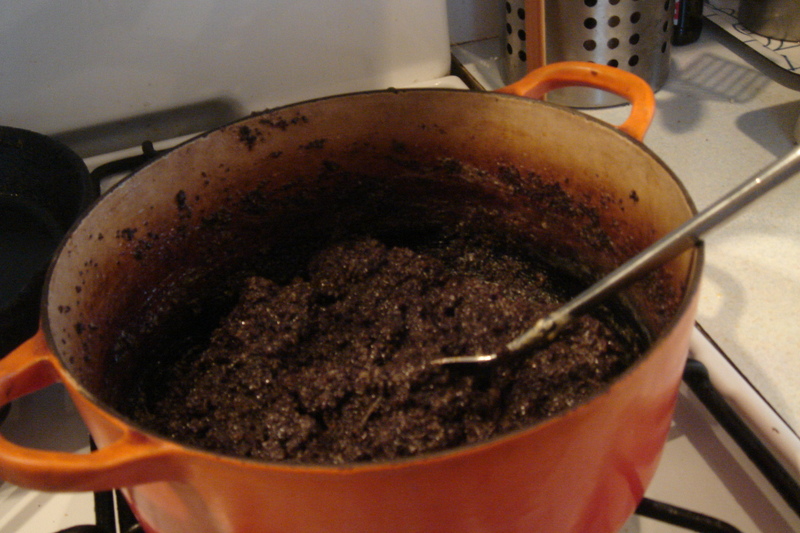 I have found that the best prunes are lovely plump ones from Agen in France but the ones that are more dried are also good, you just have to soak them for longer before you can take out the stones. You can of course use ready stoned prunes – I just prefer the ones with stones in – though they are increasingly harder to find – I can get them from a Nut & Dried Fruit stall in Leeds Kirkgate Market. However in January 2017 there were no prunes with stones on the market. The lady on the stall said this was because of a very poor harvest – so I have had to use stoned prunes to try out the recipes for the photographs & this post. At least an hour before you want to roast the pork, put the prunes in a small bowl and pour boiling water over the prunes to cover them. Leave them to plump up and then remove the stones from the prunes. Retain the liquid from the soaking as this will be needed. Pre heat the oven to Gas Mark 5 – 1900C. Place the pork in a roasting tin and rub some coarse salt onto the fat on the top. Put the prunes under and around the pork with the water from the soaking & extra to cover the bottom of the roasting tin and place in the oven. Roast the pork – about 1 ¼ hours should be enough for this weight, baste the meat with the liquid from the prunes and juices a couple of times, adding extra water if needed. When the meat is ready, take out of the oven, cover with foil and then a tea towel and leave it to rest. Add the honey to the prunes and juices, stir these together over some heat in the roasting pan, you may need to add some more water. Slice the pork and place on a serving dish and place the prune mixture around the pork to serve. Here served on a Royal Doulton Plate – Carnation 1982-1998. 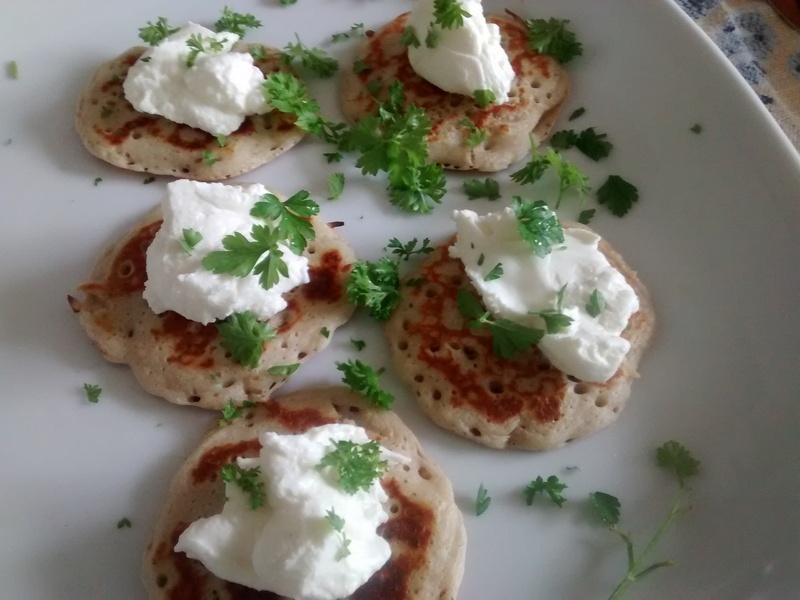 Buckwheat (Fagopyrum tataricum) is used very much in Polish cookery as the plant grows well in a cold climate. Buckwheat requires a well drained soil but without too much fertiliser – lots of fertiliser reduces the yield. 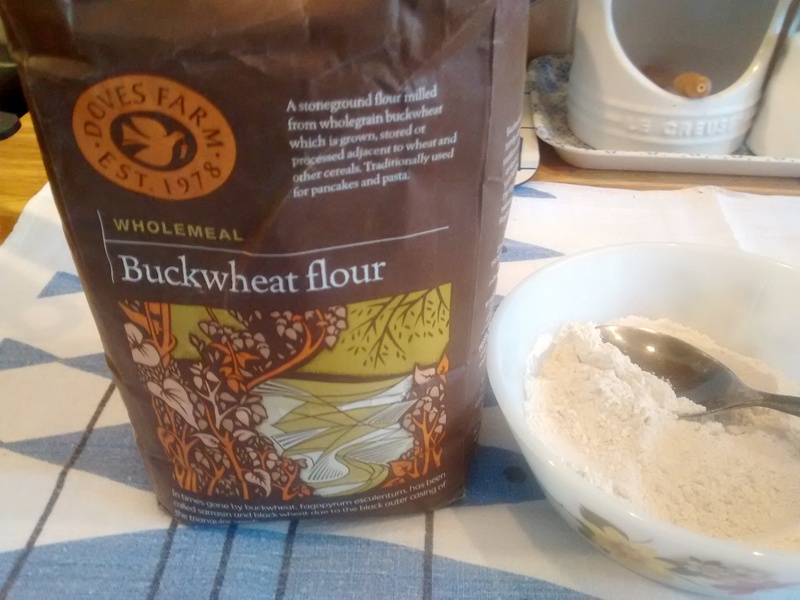 It is not in fact a grass or cereal crop but the flour is used in much the same way as wheat. 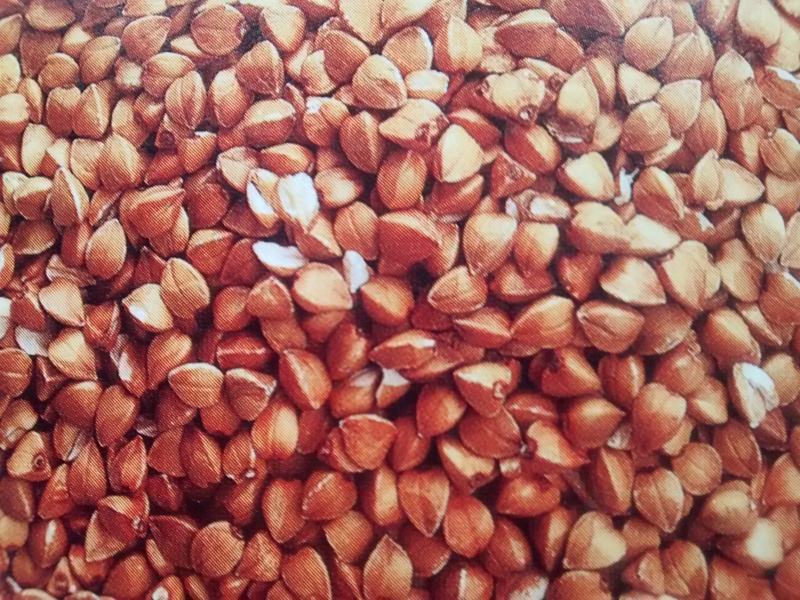 Buckwheat is related to sorrel and rhubarb and has small triangular seeds. The plant originated in South East Asia and then was brought to Europe. I have read that it came to Poland via Manchuria and Siberia but the Polish word for buckwheat – gryka indicates that it came from the Greeks – I have also read that the plant was brought to areas of what are now Eastern Poland, Russia & the Ukraine in the 7th century by Byzantine Greeks. 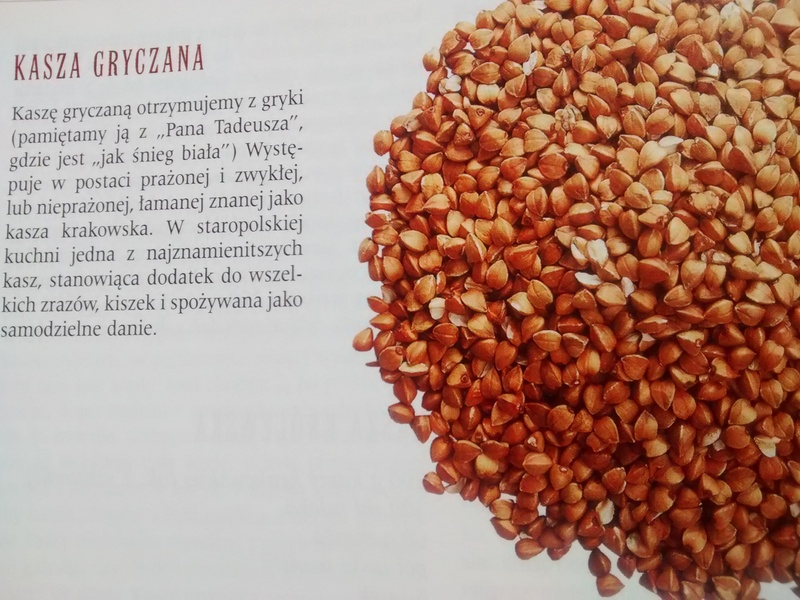 Another regional word used in Polish for buckwheat is hreczka – this again suggests a Greek origin. The triangular seeds have a strong scent which is quite distinctive and the flour is grey/speckled black in colour. 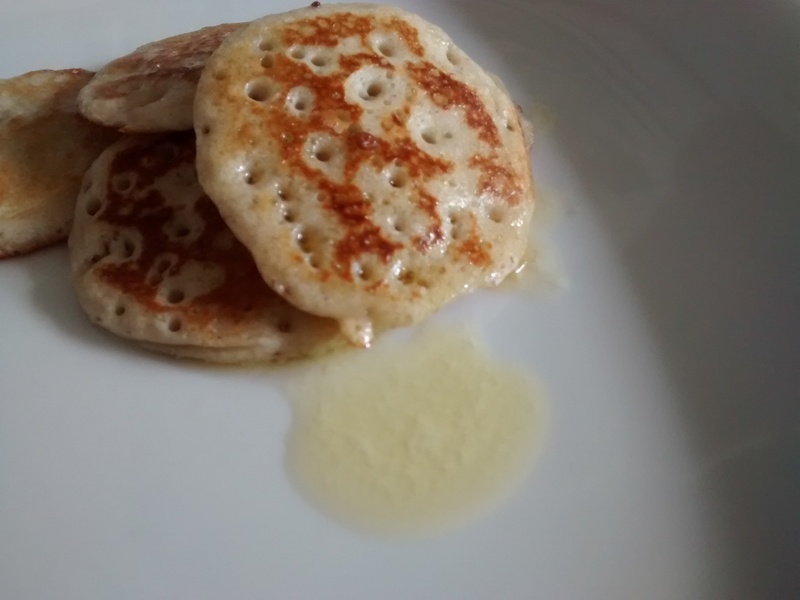 It is mixed with wheat flour to make pancakes and bliny. Bliny are popular in Eastern Poland and in the area called Kresy – the Eastern Borderlands – from where both my parents came as well as in the Ukraine and Russia. The word bliny is plural – I doubt very much if the singular blin is much used! 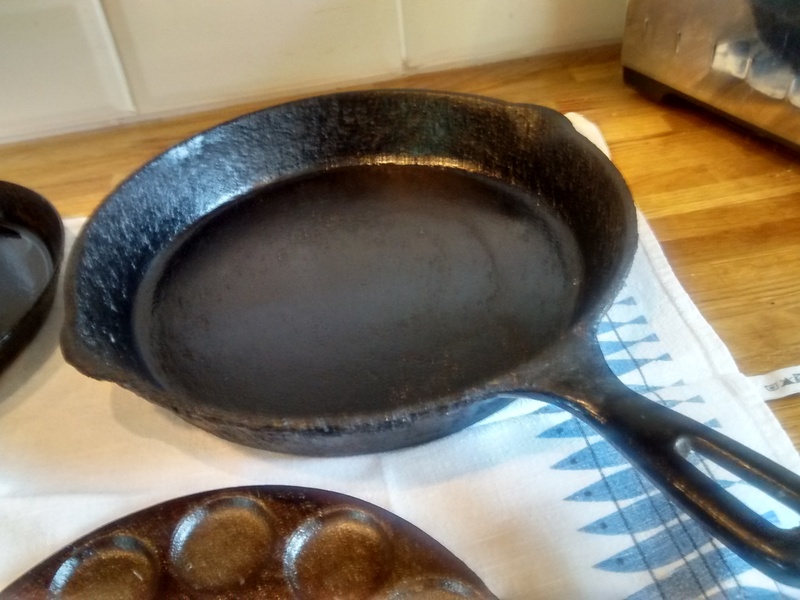 Bliny are best cooked on a griddle or a cast iron frying pan. 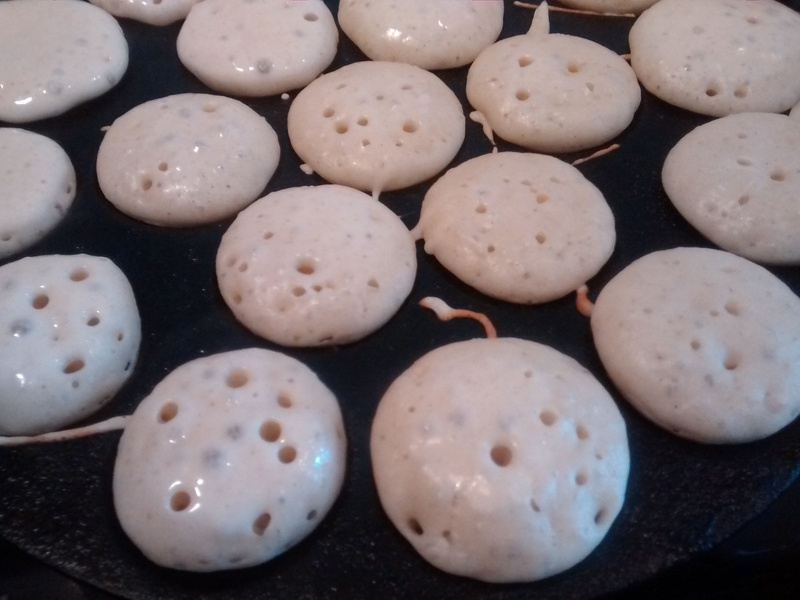 Bliny are small risen pancakes made using yeast they are in the American style of pancake. Bliny can be served warm or cold – I much prefer them warm! 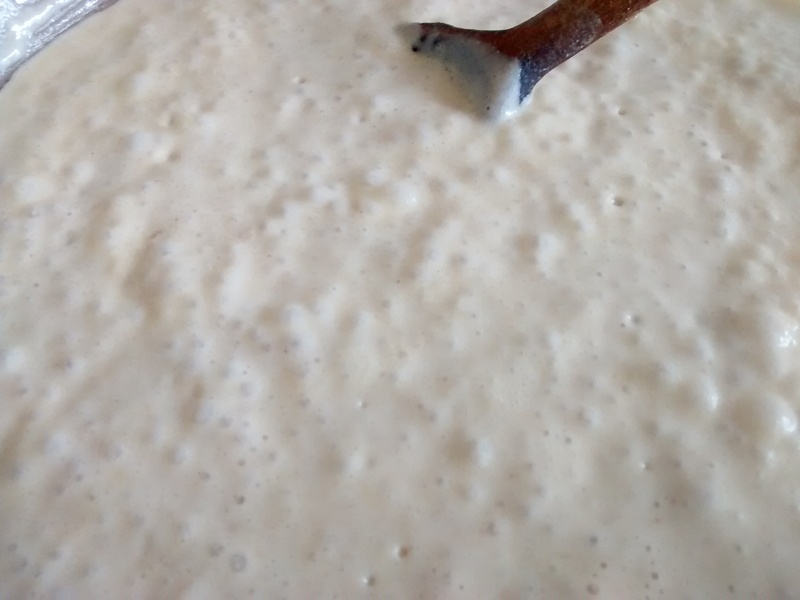 Put the yeast, sugar and milk in a bowl and leave to rise. (You can place this over bowl of warm water). 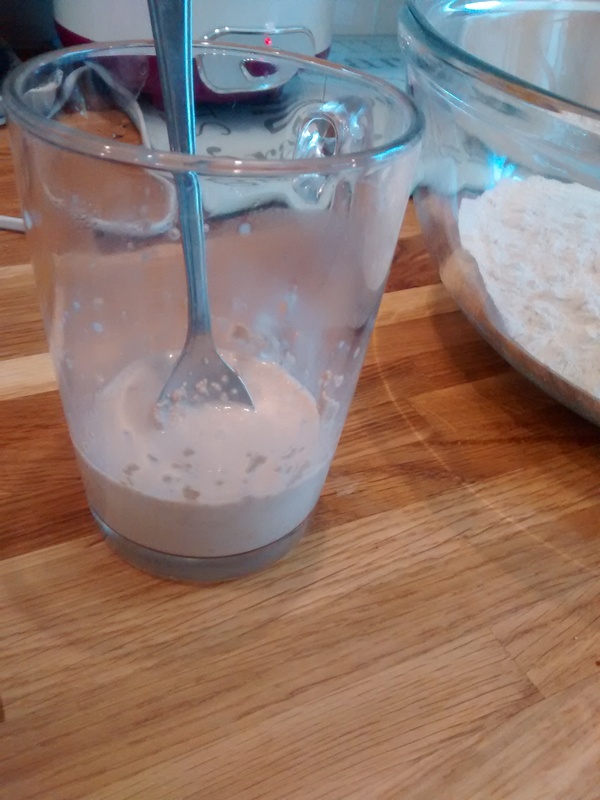 In a large bowl mix the flours together and add yeast mixture and then the beaten egg. Add the water bit by bit until the mixture is like pouring cream, you might not need it all. Add the pinch of salt and the melted butter then cover with a cloth and leave to rise. 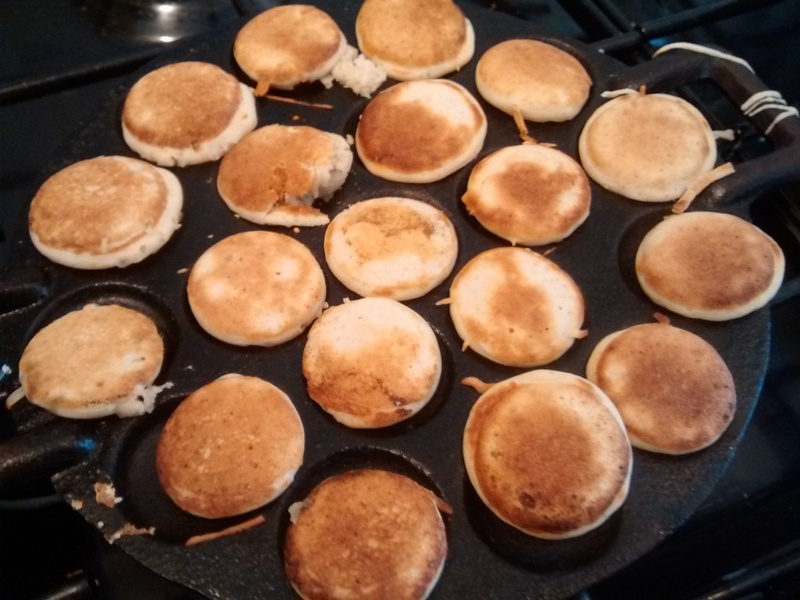 Use the risen batter to make small pancakes by using 1 large tablespoon per pancake – I make 3 or 4 at a time in my lightly greased cast iron pan. Once you get the pan hot, lower the heat to a steady low so as not to burn the bliny. Once they are cooked on one side, turn then over using a spatula and cook for a few minutes more. Serve the bliny with any of the following: melted butter, soured cream, twaróg, yoghurt cheese or cream cheese, smoked salmon, pickled herrings or even caviar, gherkins, fried onions, skwarki (crispy bacon bits) fried mushrooms and one of my favourites a fried egg. 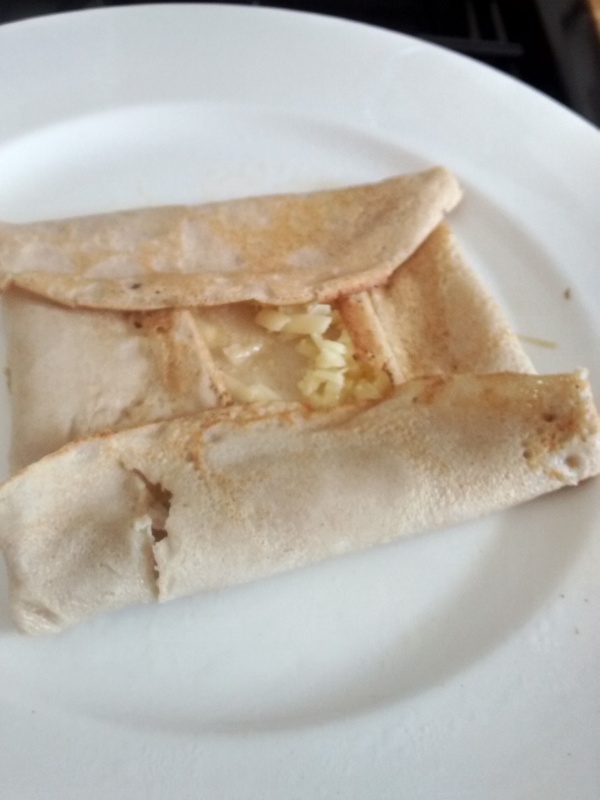 These are thin pancakes and are also very popular in Northern France where they are called gallettes de sarrasin. The French for buckwheat is sarrasin or blé noir. 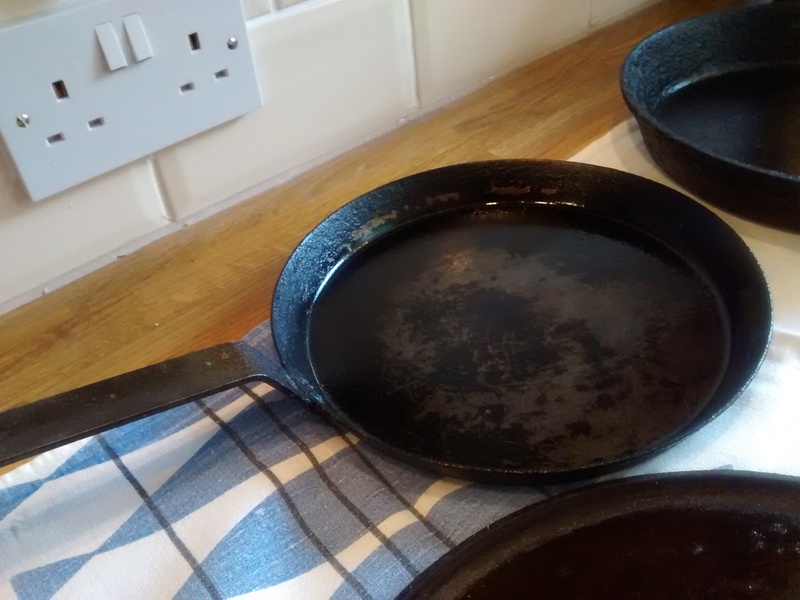 Many years ago whilst on holiday in France I bought and brought home a very large French pancake pan. 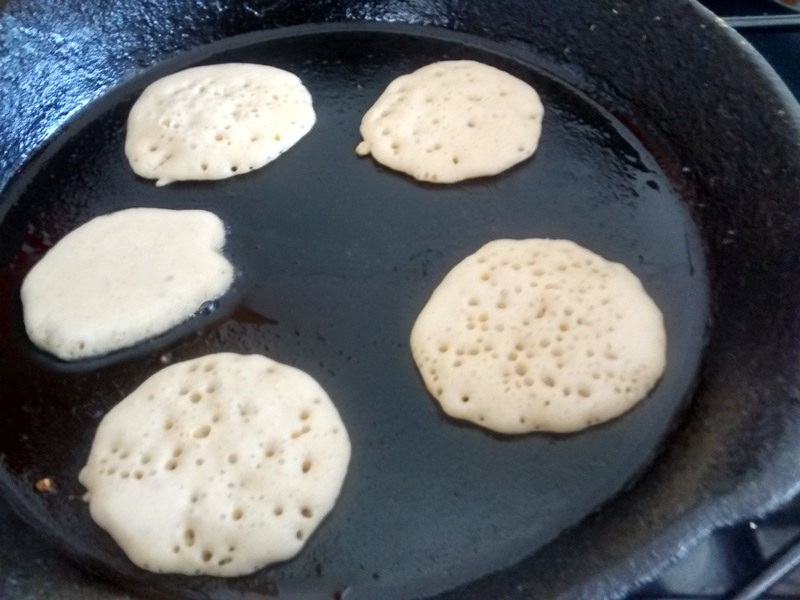 However on my gas stove it is too large for a good distribution of heat – you get a hot spot in the centre which tends to burn that part – so I use my smaller pancake pan. 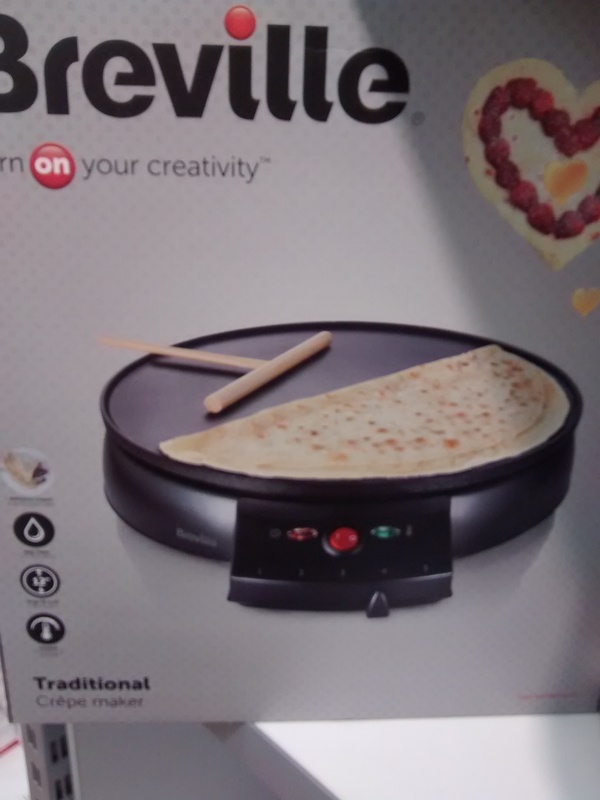 Last week whilst in a department store in Leeds I saw the following – An Electric Crêpe Pan – It might be good. Some extra milk might be needed. 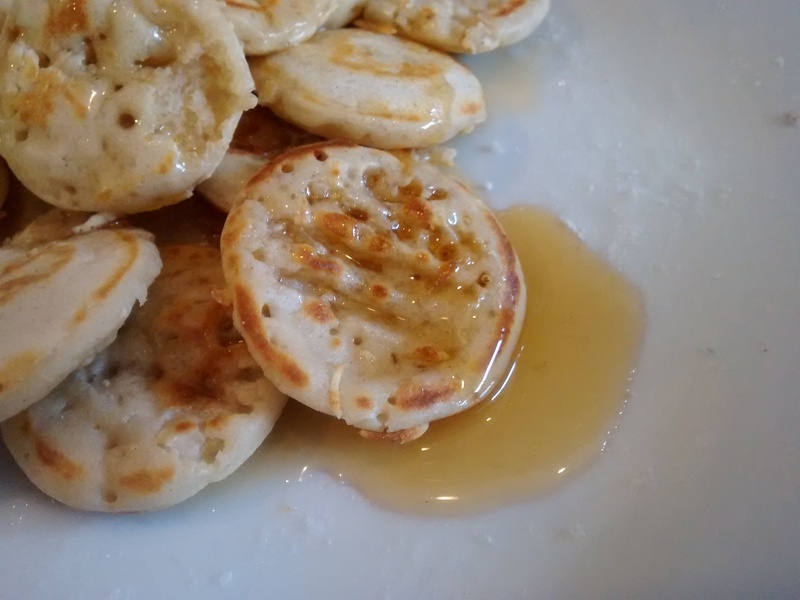 Make these in the same way as standard pancakes adding the melted butter after the batter has been standing for about an hour. 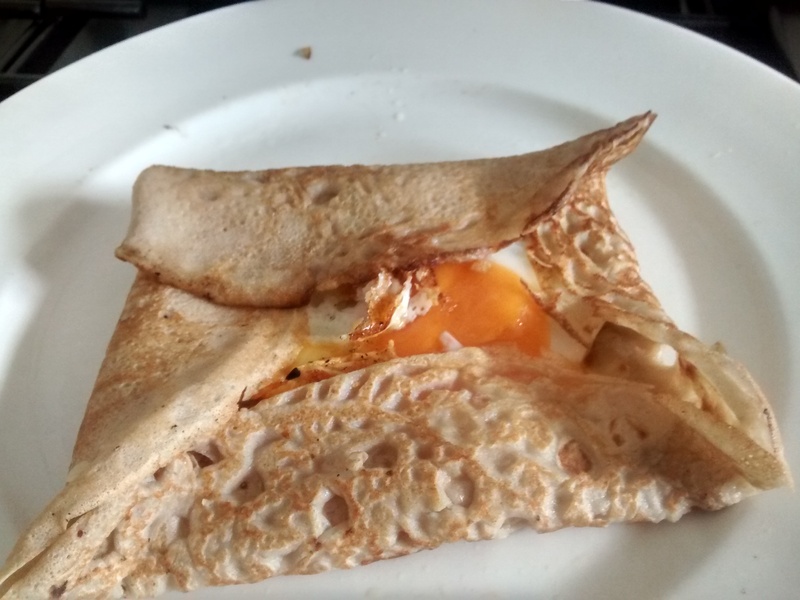 I think these pancakes are best with savoury fillings and my favourite is in fact French in origin, Breton style with a slice of good ham, grated Gruyère cheese and a soft fried egg. 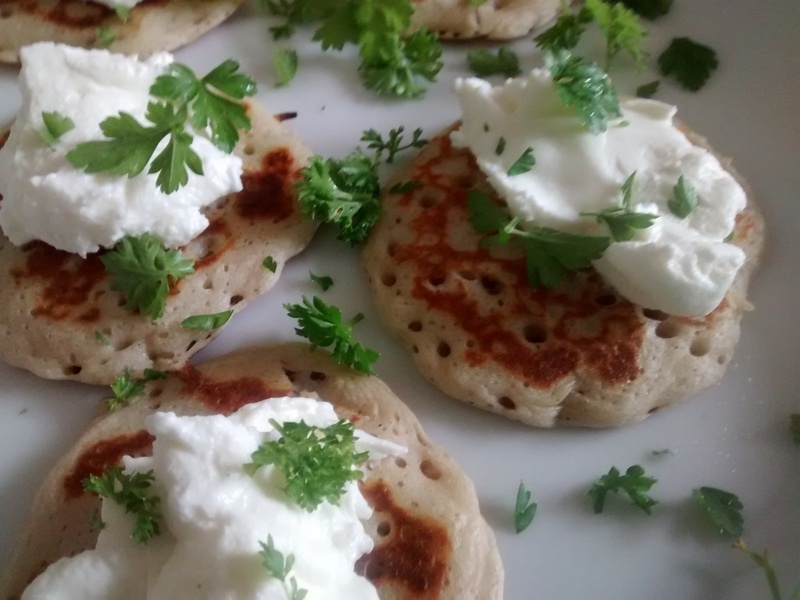 These mini buckwheat pancakes are Dutch in origin and it was only as I was trying out the recipes again that I realised how similar they are to bliny – but these are not served with savoury toppings but with icing sugar. 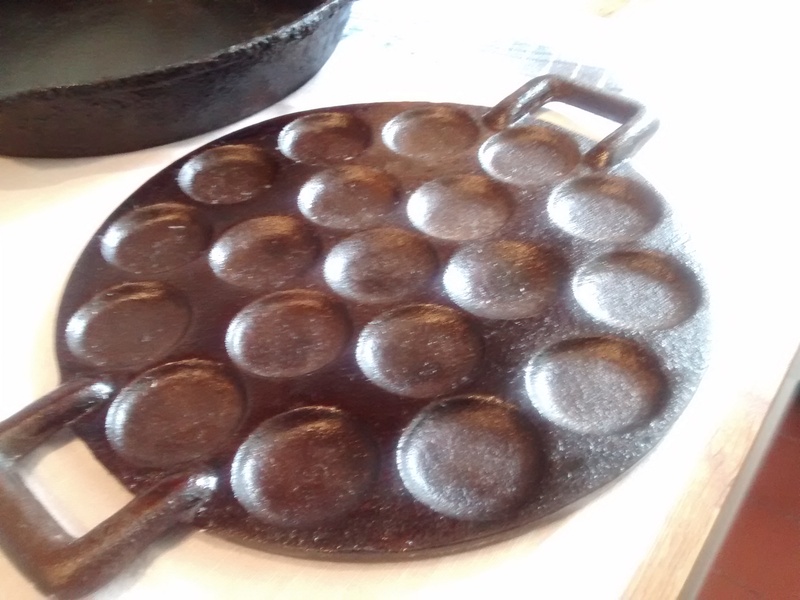 Several decades ago when on a visit to The Netherlands I bought a special cast iron pan which is used for making poffertjes . It was in the days before cheap flights & just hand luggage and I had travelled there by car – not as easy to bring home without. 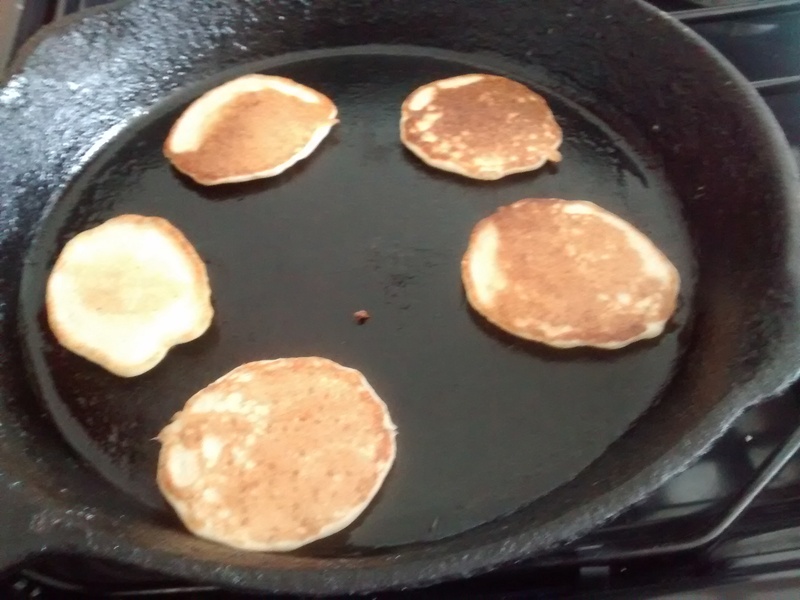 If you do not have access to the authentic pan you can make them on a frying pan – my cast iron pan works very well. 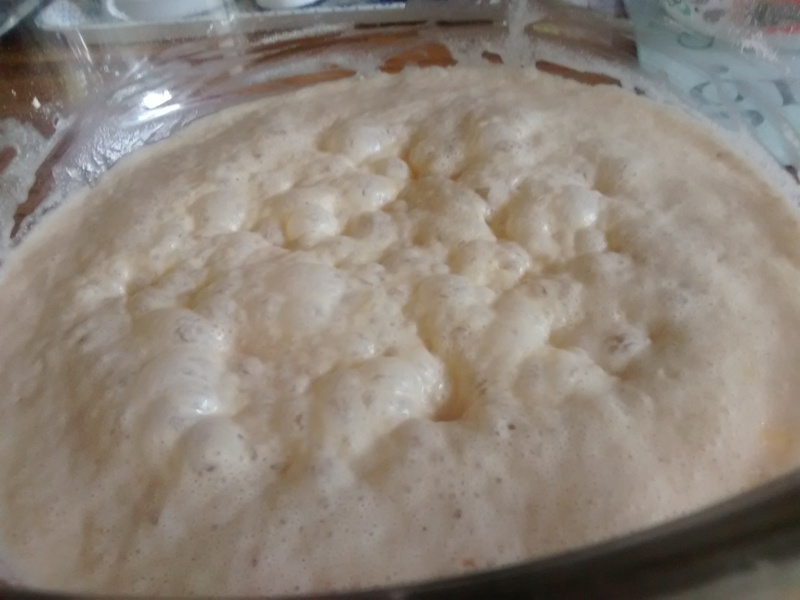 In a small bowl or jug dissolve the sugar, the yeast and around 50 ml of the milk. 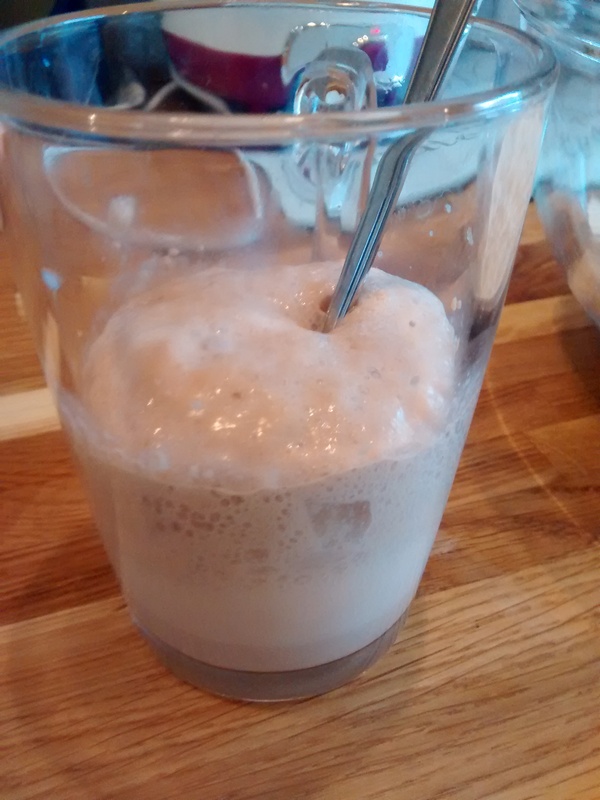 Leave for around 10 minutes or so as it froths up. In a separate bowl, combine the buckwheat and wheat flours, salt, egg, yeast mixture and half the remaining milk and mix well. 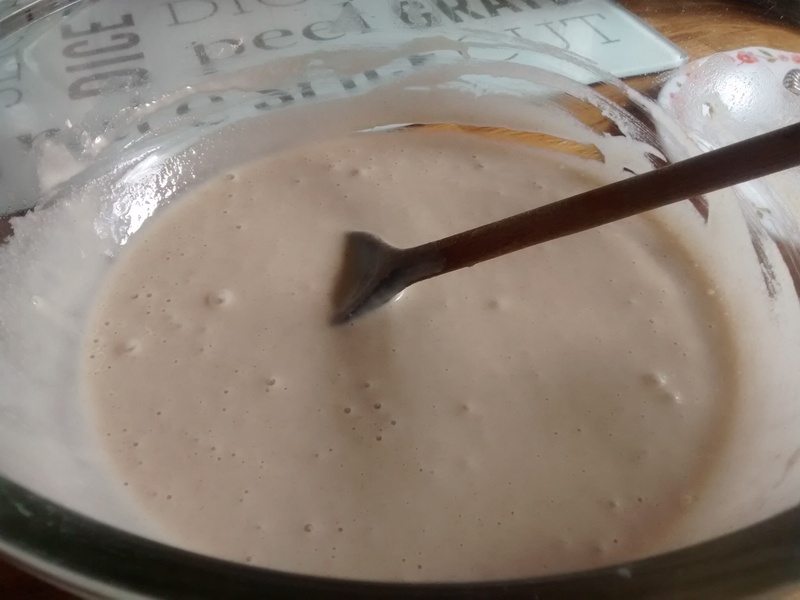 Now add the remaining milk until the mixture is like double cream – you might not need all the milk. Cover the bowl and leave for around 1 hour until the mixture has bubbled and risen. 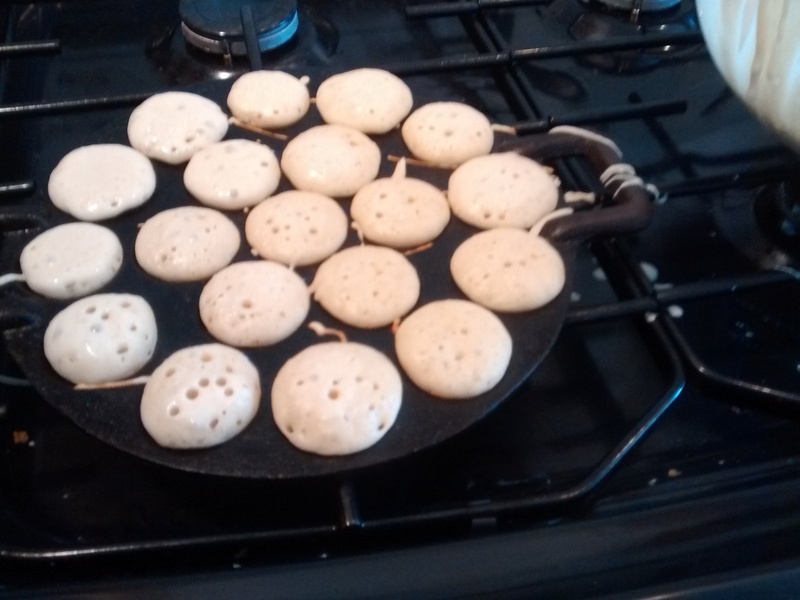 Lightly grease the pan and heat the pan – keep it the pan warm but not too hot or you will burn the poffertjes. 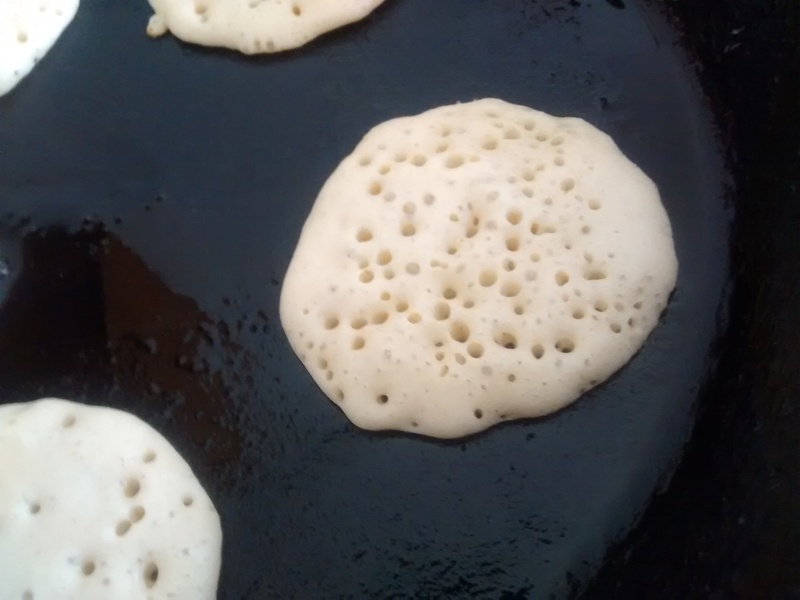 Using a teaspoon fill each indentation in the pan – you need around 2 teaspoons for each. 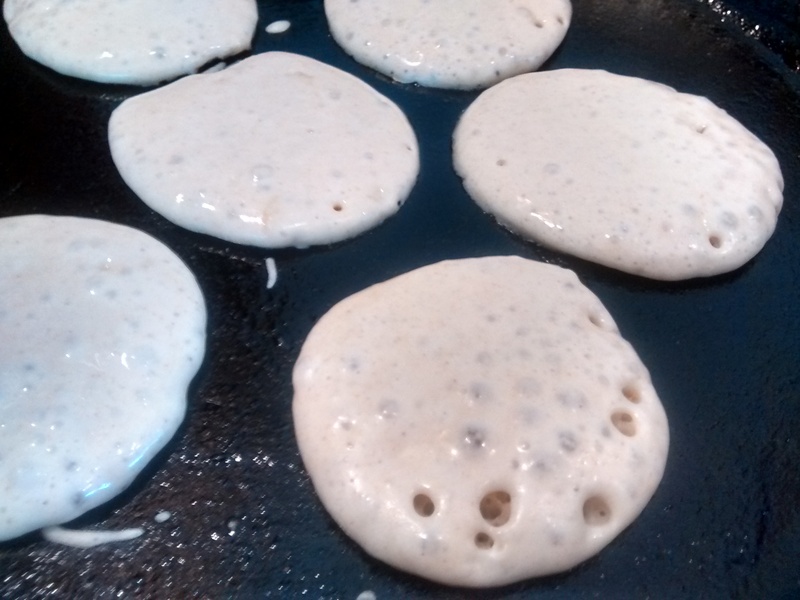 Turn the poffertjes around as soon as the bottom has set, using two forks. Dredge the poffertjes with lots of icing sugar. 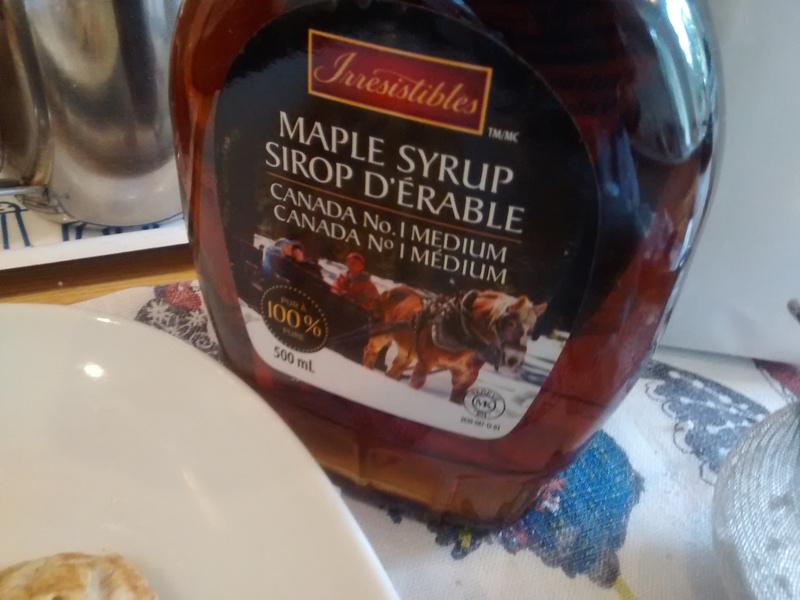 One of my friends who now lives in Canada brought me a large bottle of maple syrup on her last visit and I tried this over the poffertjes instead of the icing sugar – they were delicious. 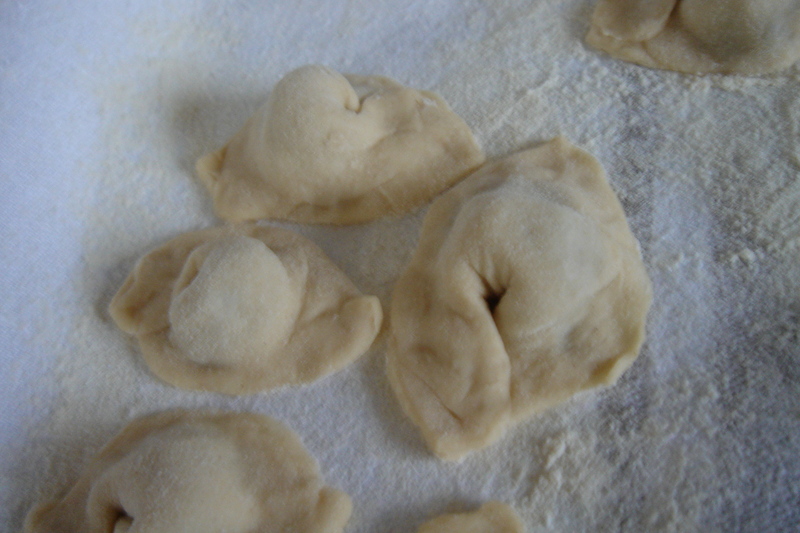 Pierogi are little semicircular parcels of pasta which are made with a multitude of fillings. 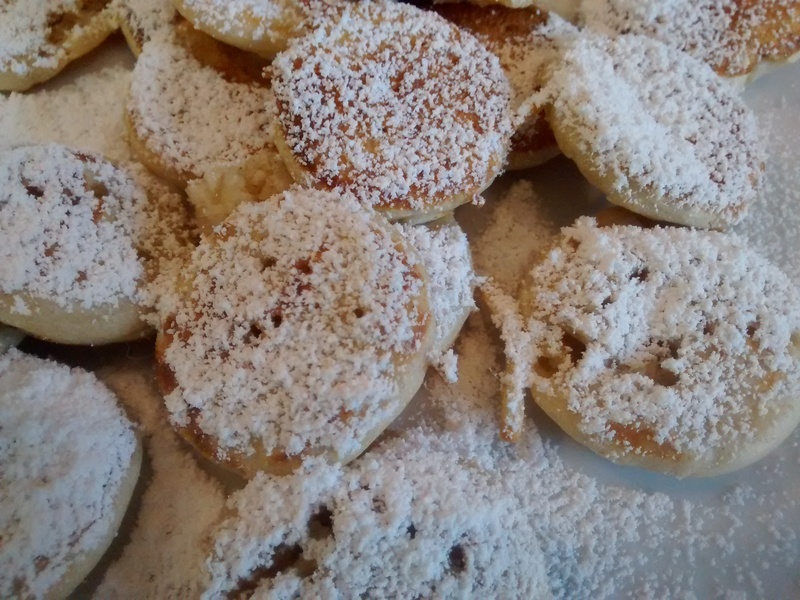 Even though I make these myself, it is the dish I always crave when I go to Poland. There are several theories as to how pasta style dishes came into Poland. The general word for pasta especially noodles is makaron , which certainly has its roots in Italian; and as Italian cooking has influenced Polish cooking from the 16th century I used to think that was where the dishes originated. 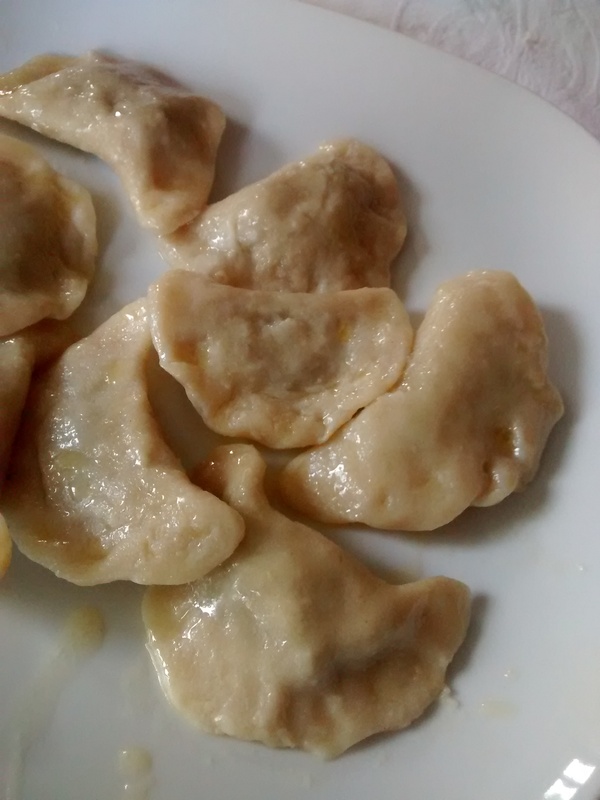 I find it amusing that ravioli in Polish are called pierogi włoskie (Italian pierogi). After doing some research it seems however that pierogi were around in Poland in the middle ages, they are mentioned in the 13th century and the name comes from an old Slav word for feast or festivity. Many people believe that they came to Poland from the Far East through Siberia and Russia. 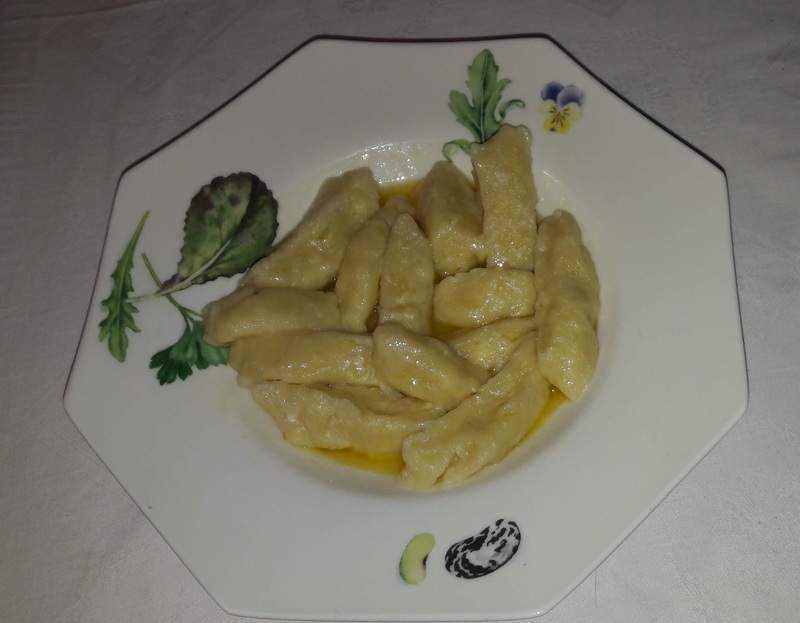 When I was in China in the 1990s, imagine my surprise when I was on several occasions offered dishes which were called Jiaoxi (dumplings) and they were exactly the same shape and size as pierogi and cooked in the same way! Whatever the origins, the Poles have made pierogi their own; there are lots of traditional fillings, both savoury and sweet, and several ways of serving them. In a pierogi cookery book I bought in Poland there are around 40 traditional ones and more than 20 new style ones. In a pierogi restaurant I went to in Kraków there were around 30 options on the menu. Pierogi are made from a thinly rolled out dough using a circular cutter, about 7 cm in diameter, we used to use a medium sized wine glass. 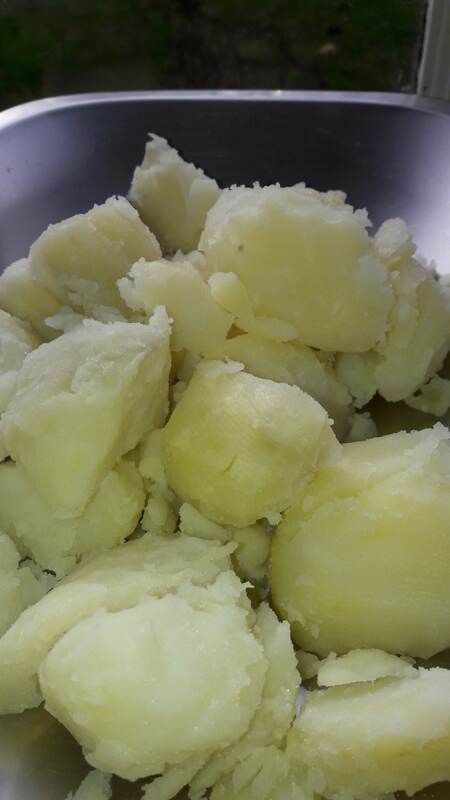 A largish teaspoon of the filling is placed on the circle and this is then folded in half and the edges pinched together to seal them – this is done to give them a slightly crimped edge. You learn from experience how much filling to put into the pierogi as too much will make it hard to seal them and if not properly sealed they will burst on boiling. Do not worry if you have a few mishaps – it still happens to me even with experience – it is hard to salvage one that has gone wrong – just accept that there will be a few that you do not cook. 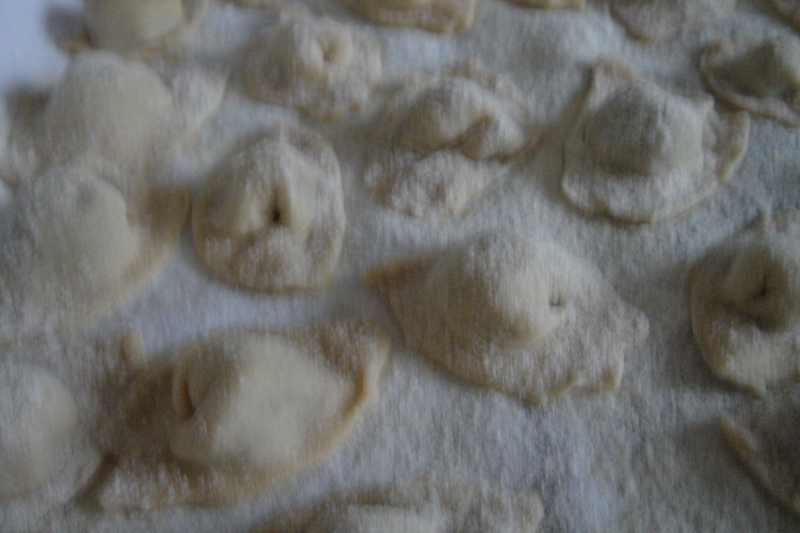 Pierogi dough is made from flour, egg and water and I have seen many variations of the recipe. The following is my mother’s and I think it is the best I have ever used and tasted. She never used whole eggs, just the yolks and this gives a dough which is soft and not tough and can be easily rolled out. The recipes which use whole eggs give a tougher dough which is much harder to roll out. Another point is that flour does vary and it is possible to add more flour to the dough as you are mixing it but you cannot add more liquid if it is too dry! 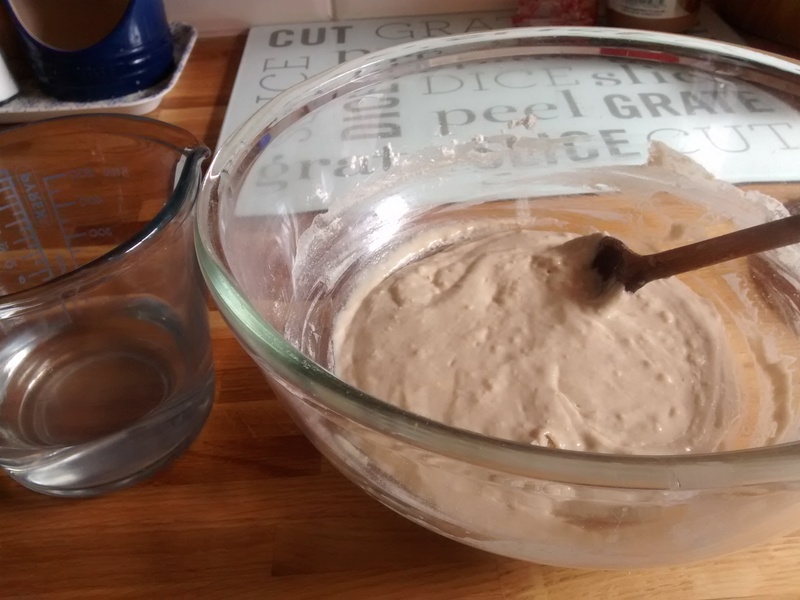 As you mix the ingredients in the first few minutes you should be able to tell if it will be too dry and you can add some more water initially but once it is all mixed together you cannot – if it goes wrong – just start again. In a jug or bowl mix together the water, oil and yolks. Pour the liquid mixture into the well and then with your hands incorporate the flour into the liquid until you have a large ball of dough. Turn this out into a floured board and knead the dough for a few minutes until it is a smooth ball. 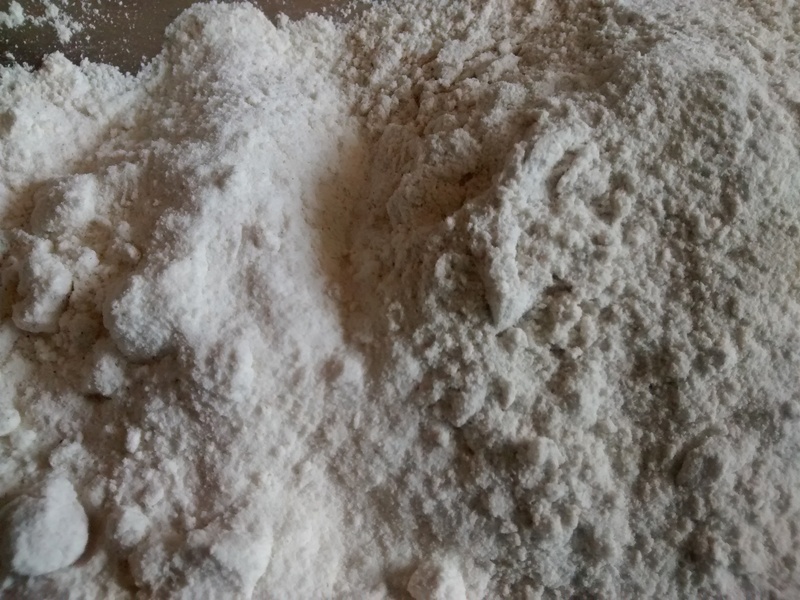 You can then use the dough straight away, cutting it into 4 quarters and rolling out a quarter at a time on a floured surface until the dough is thin. You can pull it out a bit at the beginning to give a more rectangular shape of even thickness. You can cover the dough with a cloth and place it in the fridge till needed. 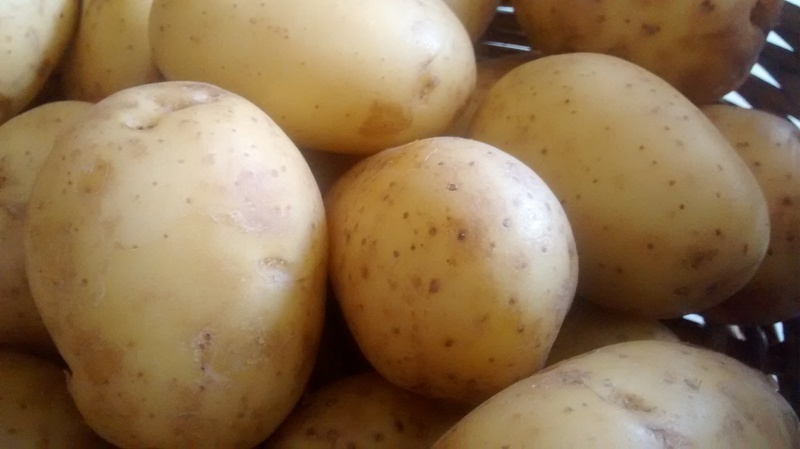 You can freeze the dough for a few days for later use, it is best to cut it into quarters and wrap these in cling film or plastic and place these in another bag or container. Rolled out the dough until it is thin and use a circular cutter, about 7cm in diameter, to make lots of circles. You can re-roll the cuttings to make more circles until all the dough is used. A largish teaspoon of the filling is placed on to the dough circle and this is then folded in half and the edges pinched using your thumb and first finger to seal them – giving them a slightly crimped edge. This quality of dough will make about 70 to 80 pierogi – depends on how thinly you roll the dough and the size of your cutter. You can open freeze pierogi so sometimes I make a batch and open freeze half of them – then store them in a plastic box. They should be cooked from frozen just allowing a little extra time. The quantities that I have given should be enough for the 500g batch of dough. Many of the fillings once made can be frozen; I sometimes make the mixture and freeze it in 2 to 3 small batches for later use. 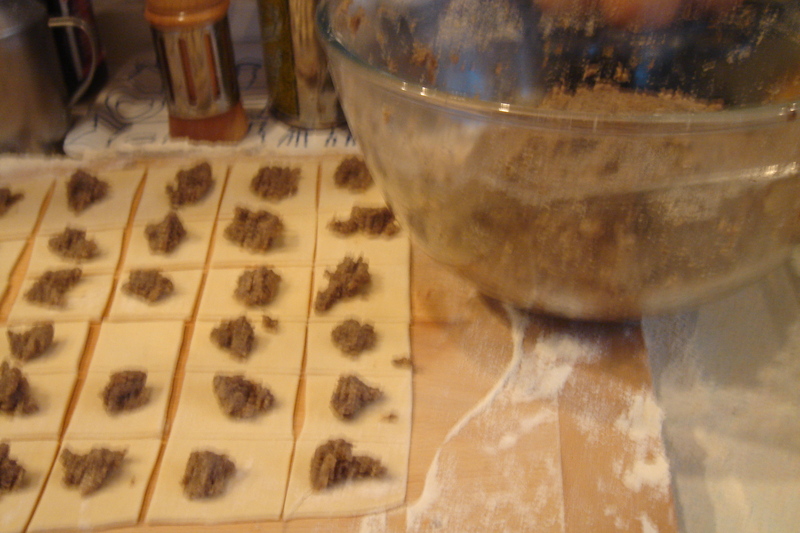 A good tip is not to make the filling too moist, as any liquid on the dough will prevent you getting a good seal. 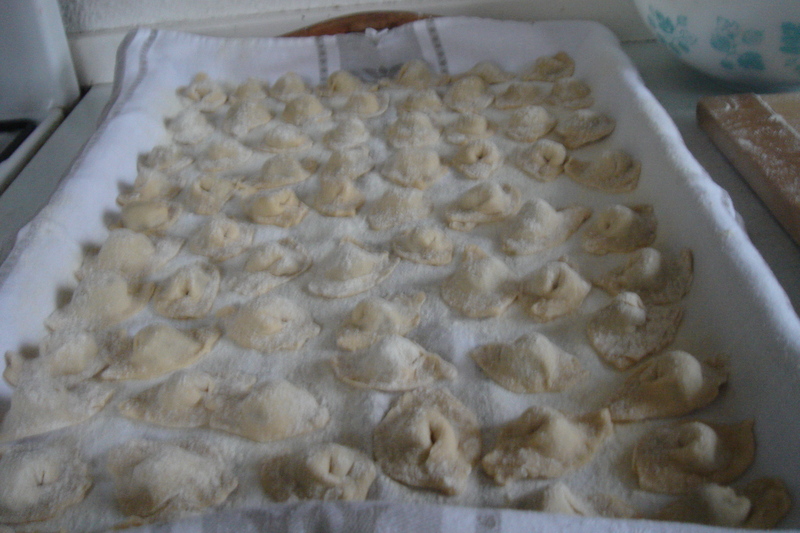 Have a large surface such as a tray covered with a cotton or linen cloth which has been lightly floured ready and place the sealed pierogi on this until they are all made, do not let then touch each other. To cook the pierogi, use a large pan of boiling water to which you have added some salt and a drizzle of oil. Drop the pierogi in one by one and allow them to boil. I usually do about 6 to 8 at a time (I only do 6 at a time if using frozen ones). As they cook they will float to the surface, let them boil for 2 to 3 minutes, a bit more if they were frozen, and then remove them with a slotted or perforated spoon and put into a colander above a pan for a few seconds to drain and serve. Continue boiling batches in the same water. 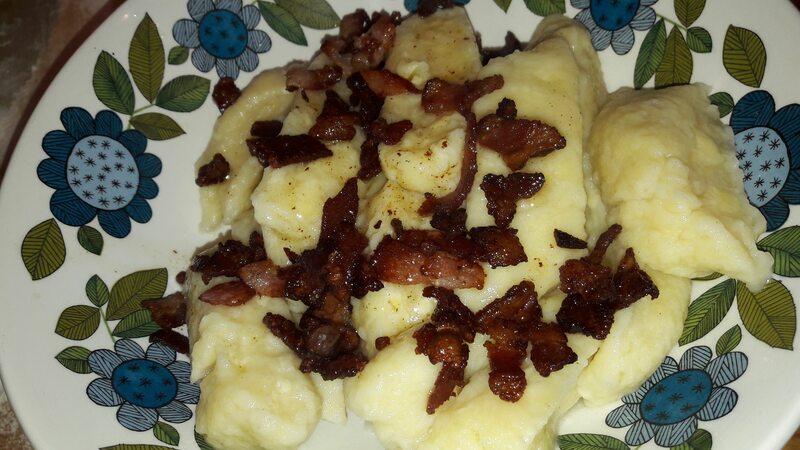 Traditionally savoury pierogi are served with melted butter, skwarki – crispy smoked bacon bits, small pieces of fried onion or melted butter and dried breadcrumbs (à la Polonaise). 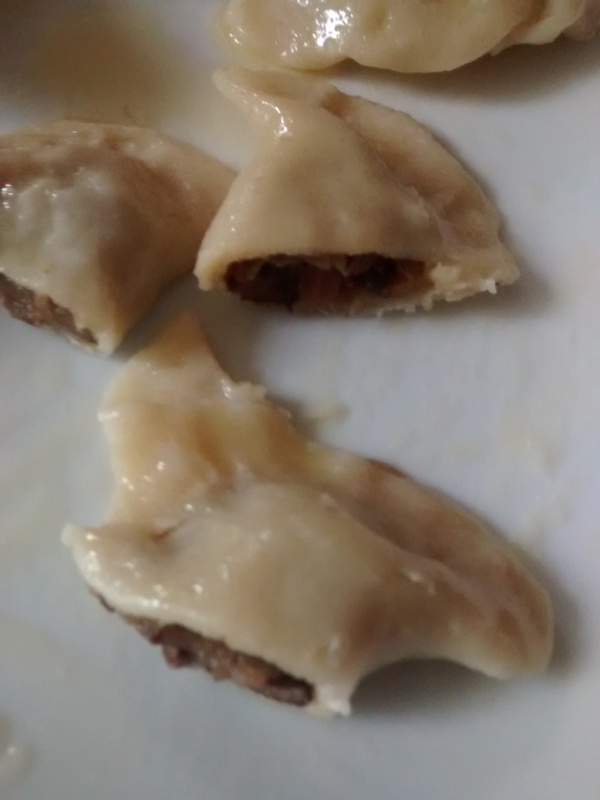 If you want to make all the pierogi to serve together then you need to get a large shallow dish and put the melted butter or skwarki or fried onions into the dish and keep the dish warm in a low oven. As you take out the cooked pierogi add them to the dish, mix them with the butter, skwarki or onions to prevent them sticking. Keep on adding more as they cook and keep shaking the dish to coat and mix them. Once your have had your meal and you have any left (I leave some deliberately) then they are wonderful fried up later. 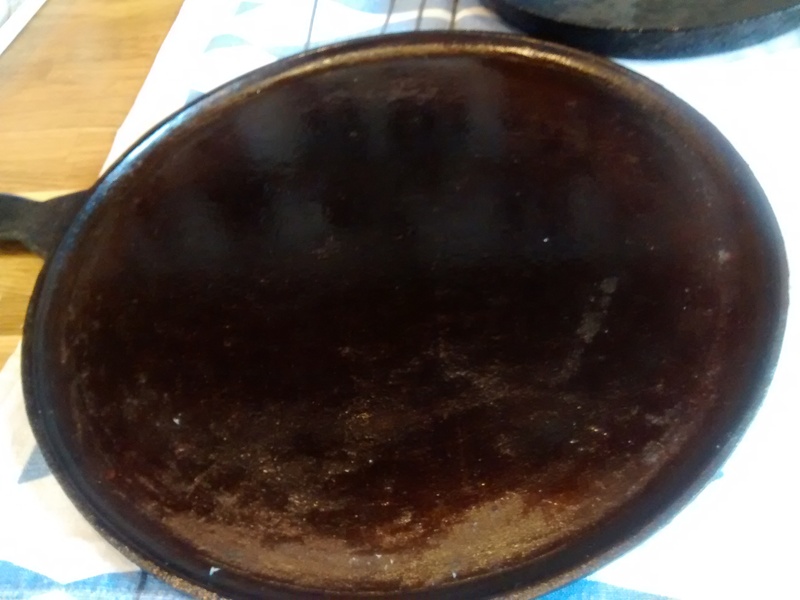 You need a hot frying pan and should be able to just use the butter etc that they are coated in, maybe adding a little extra oil if needed. Fry them till the dough is golden and crispy. Below are some of my favourite fillings. All the filling must be allowed to cooled before using them – you can make these in advance – even the day before. Put the mushrooms in a small bowl and cover them with boiling water and leave them overnight. Strain the mushrooms but keep the liquid and then chop the mushrooms into small pieces. 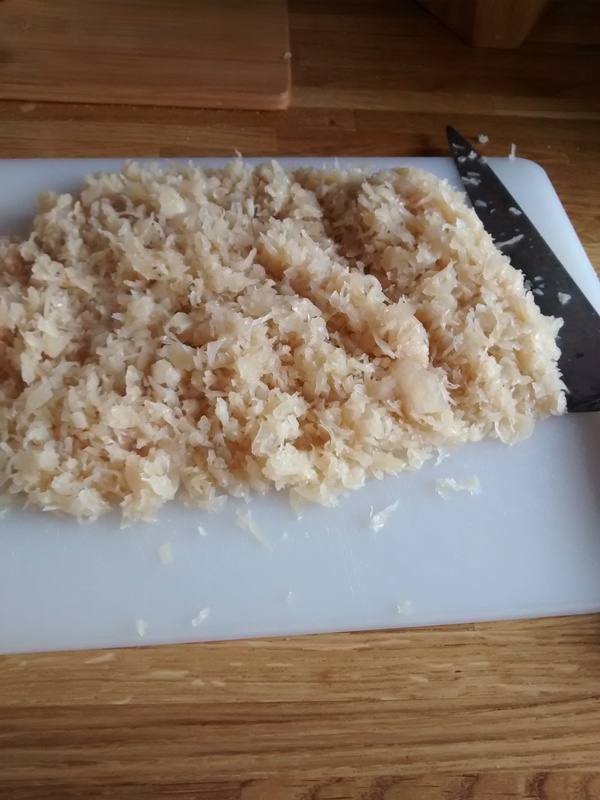 Strain the sauerkraut but keep the liquid and chop the sauerkraut into small pieces. Put the sauerkraut with the liquid from the tin or jar into a pan and cover with boiling water. Add some of liquid from the soaked mushrooms and the bay leaf. Boil the sauerkraut gently for about 30 minutes. Then uncover and boil off as much of the liquid as possible – without burning the sauerkraut. Allow the boiled sauerkraut to cool and remove the bay leaf. 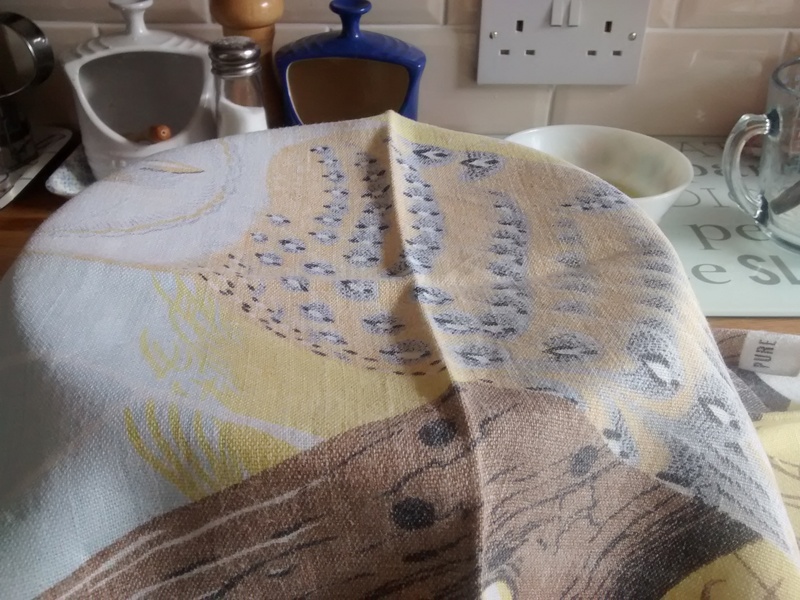 Strain it using a sieve and pressing it down with a spoon to get the mixture as dry as possible (If you want you can put the strained mixture into a clean dry cotton or linen teacloth, twist the ends together to squeeze it to get it really dry). Whilst the sauerkraut is cooking heat the chopped mushrooms gently in a small pan with the rest of the liquor, stirring to prevent it burning but reducing as much of the possible. 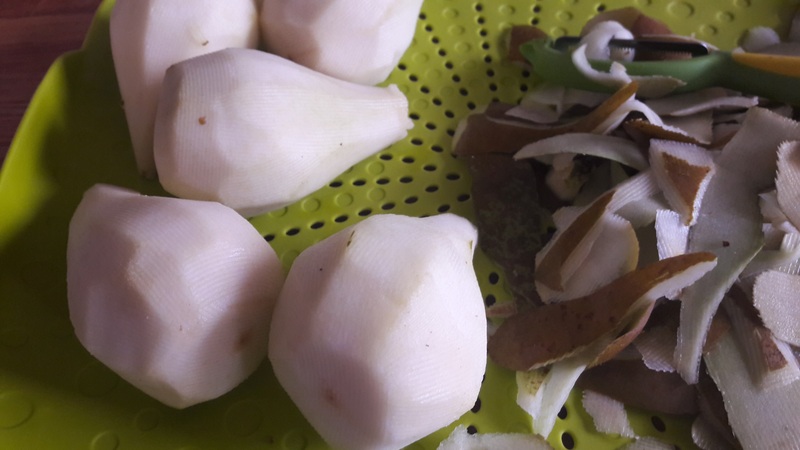 Chop the onion finely and fry it till it is soft and golden and add this to the mushroom mixture and mix it well together. Mix the sauerkraut, mushrooms and onions together and add some ground black pepper to taste; salt should not be necessary. 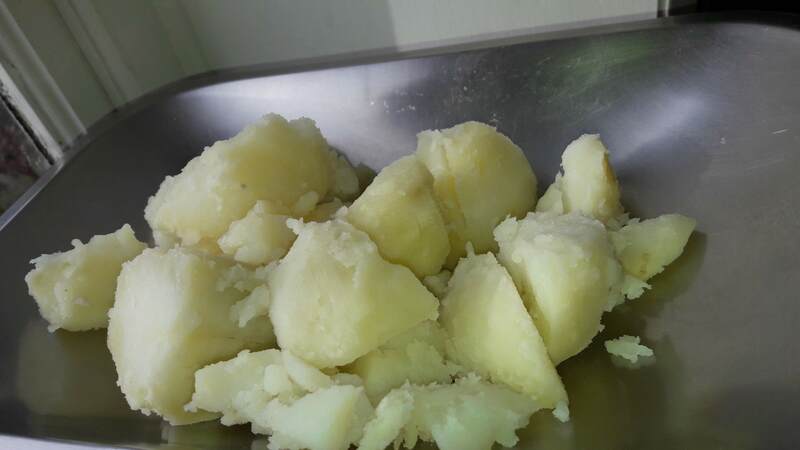 Peel and boil the potatoes in salted water, strain and mash, then leave to cool. Chop the onion finely and fry it till it is soft and golden, allow it to cool. Mix together thoroughly, the potatoes, onions, cheese and egg yolk. 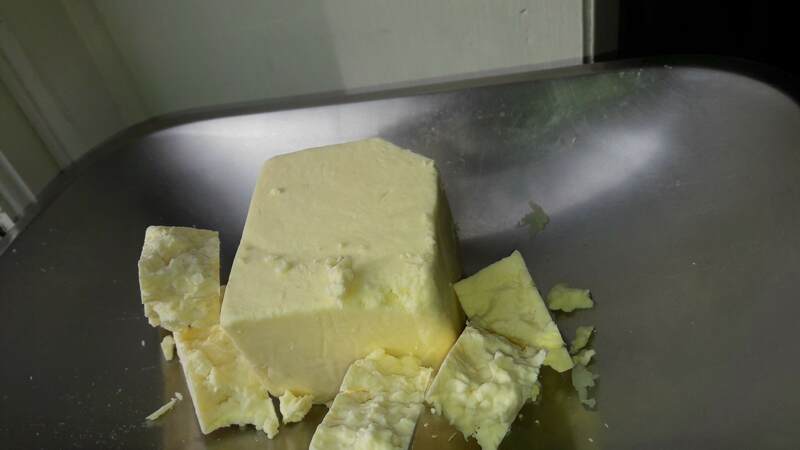 When my mother did not have any curd cheese, she used Lancashire cheese, as that was the cheese most readily available to her. Both versions taste good, the secret with this one is to grate the cheese as finely as possible and mix it in well. Grate the cheese as finely as possible. My mother would boil extra potatoes on one day and save some to make these fillings the next. Put the pork into a small casserole dish and cover it with the stock and put on the lid. Put the dish in the oven for at least 1 hour, depending on the meat you might need longer. I cook the meat until it is tender and can be broken up with a fork and most of the liquid has been absorbed. Allow the meat to cool. You can mince the meat but I find that if you cook it long enough you do not need to, you can just chop it with a sharp knife . Mix thoroughly together: the meat, onion, yolk and breadcrumbs and then add salt and pepper to taste. You can cook a piece of breast chicken as for the pork filling, however neither my mother or myself ever did this; we used leftover roast chicken from a roast dinner. 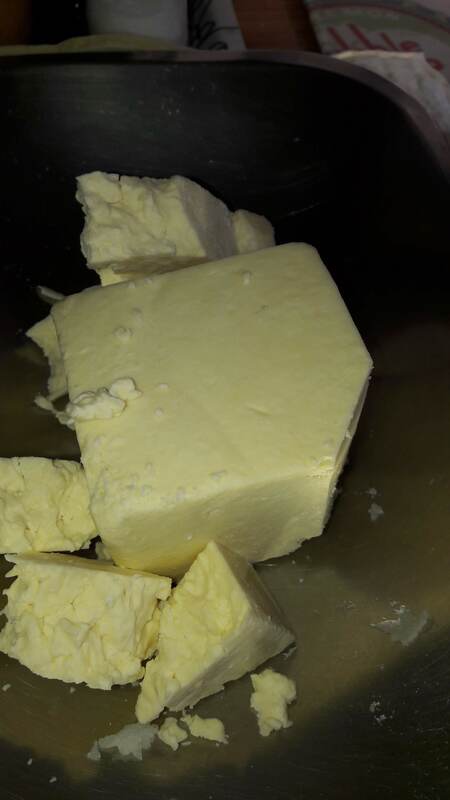 Take the slice of bread and remove the crusts removed and leave this for half an hour in a bowl with a little milk – do not use the excess milk just the wet slightly squeezed bread. Finely chop or mince the chicken. 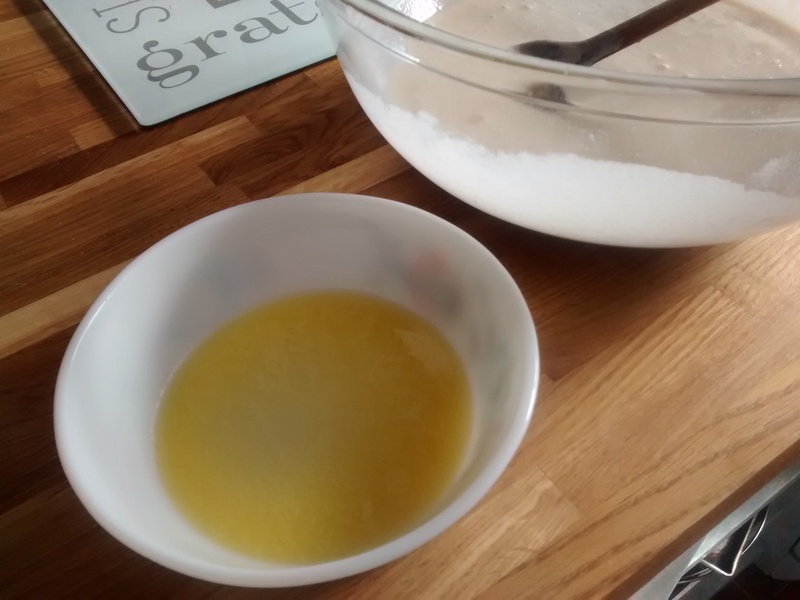 Mix together the chicken, onion, egg yolk and bread to get a uniform mixture. 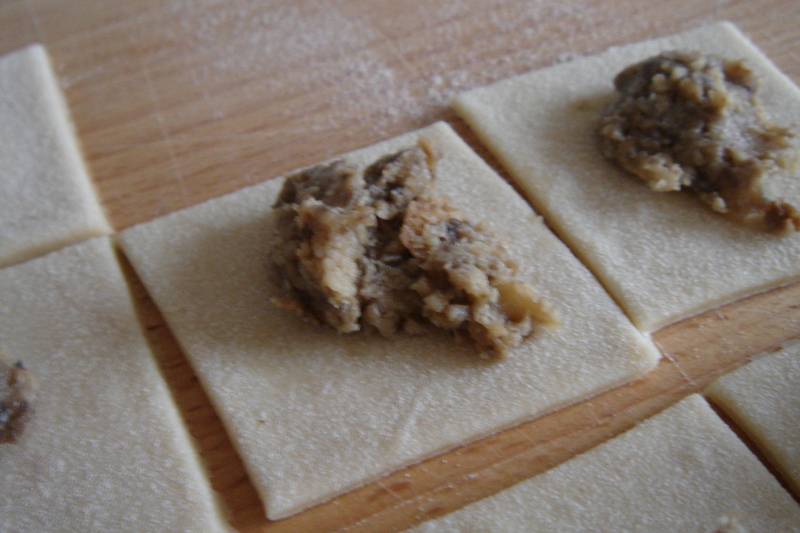 The dough and method of making sweet pierogi is just the same as for the savoury ones. 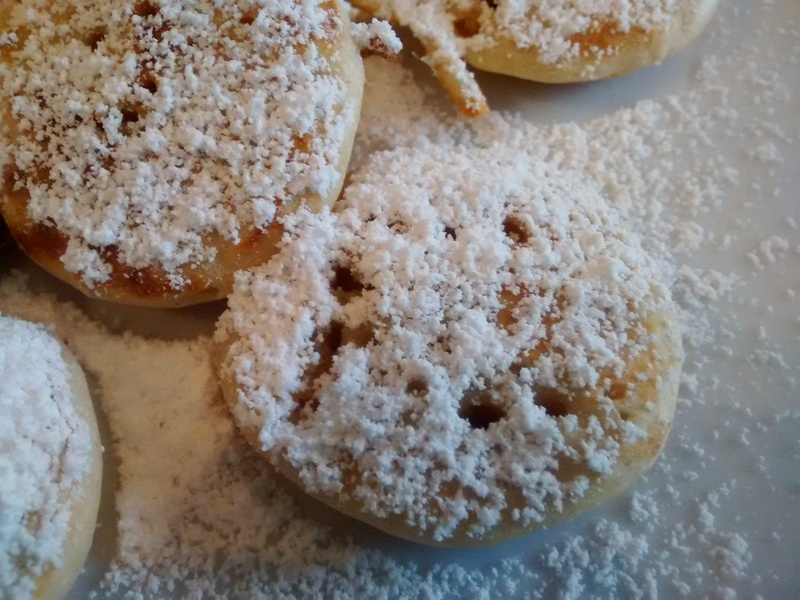 Once boiled sweet pierogi are dredged with icing or caster sugar and are often served with soured cream. They are best eaten straight away. I must admit that when I was younger I did not really like sweet pierogi but now I think they are utterly delicious especially when with soured cream. Thoroughly mix all the ingredients together. In the summer in Poland, when all the fruits of the forests and the garden are ripe, that is when these pierogi are at their best. However bottled fruit is available all year round and I often make my sweet pierogi with these. Whinberries (bilberries) these grew in Lancashire near my home and also could be bought in baskets imported from Poland. (I think the larger American Blueberry is nowhere near as tasty.) When we went to pick these I know this always made my mother think of her childhood in Poland. I tend to use half the amount of dough when making these fruit ones as they do not freeze well with fruit. Depending on the size of the fruit, you need about 3 or 4 per circle. Do not add sugar to fresh fruit as this will make too much liquid and the pierogi will not seal. If using bottled fruit you need to strain as much juice away as possible. 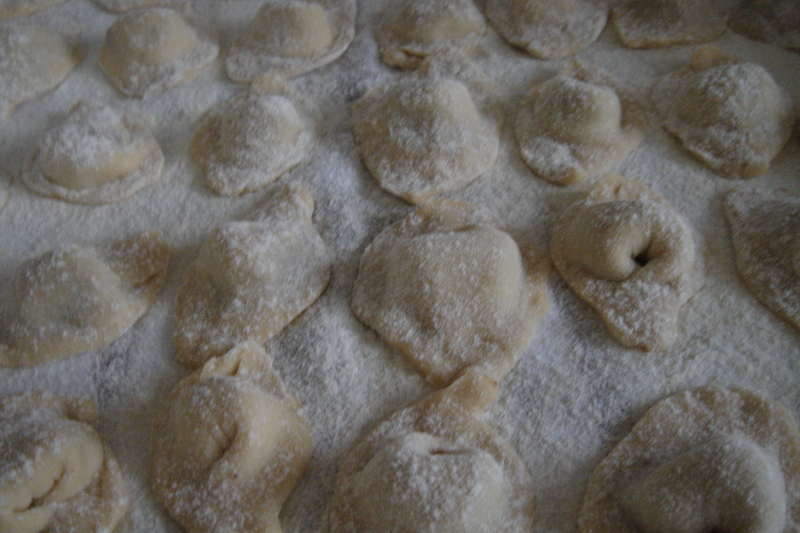 Drenched the cooked pierogi in icing sugar and serve with sour cream. The sugar contrasts with tartness of the fruit. 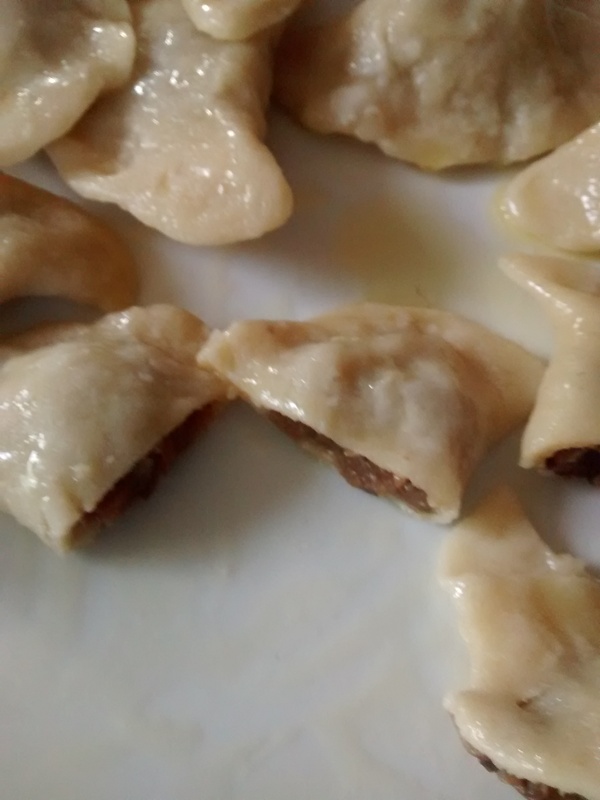 To me these are sweet pierogi – but I have been assured by my aunties in Poland – who made them for me on my last visit – that because of their shape – round balls – these are always called knedle. 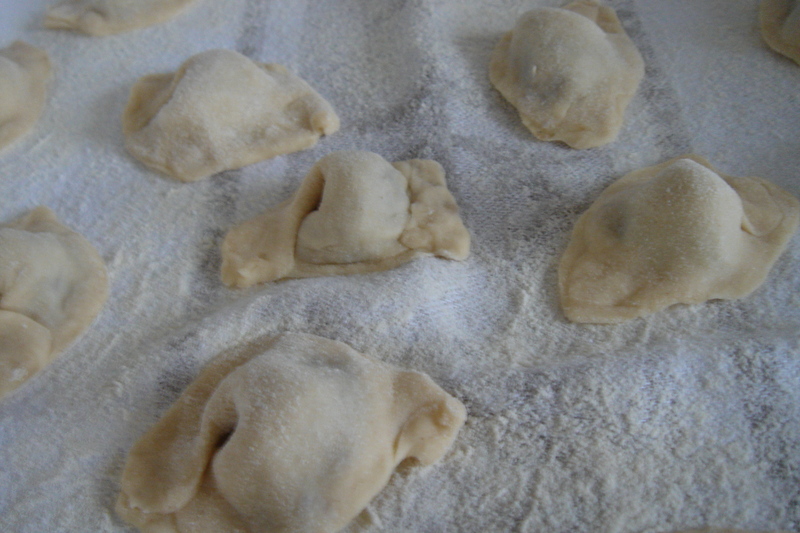 The dough is just the same as for pierogi and they are boiled in just the same way but will take a bit longer to cook depending on the size of the plums. 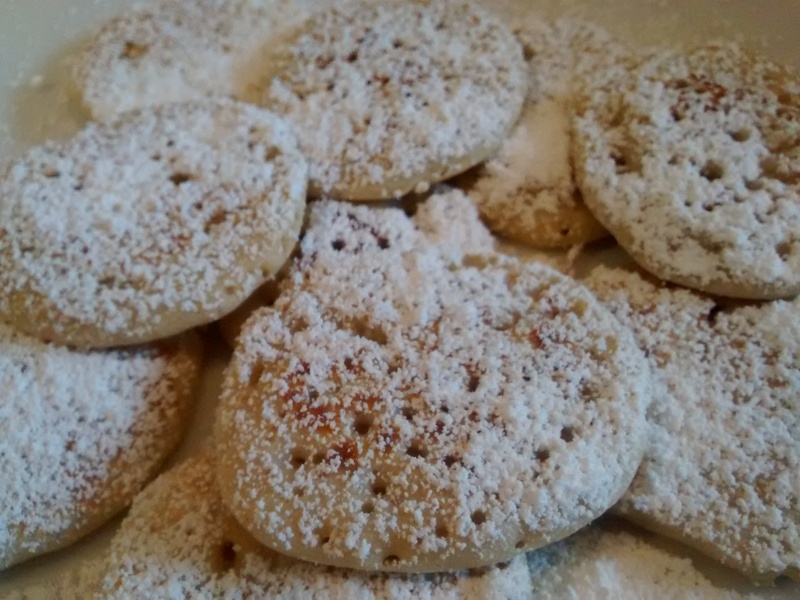 Serve them dusted with icing sugar and serve with soured cream. 500g fresh plums – small ones are best for the round shape & sugar – you will need about a half a teaspoon per plum. Wash and dry the plums and remove the stalks. If the plums are small then use whole ones and if they are large use a sharp knife to cut them in half and remove the stone. Cut strips of dough more than twice the size of the plum or plum half. Place the plum on one side and sprinkle with the sugar. Fold over the other part of the dough and seal the edges well with your fingers – take care as the added sugar produces liquid – use excess dough to give a good seal then cut away the excess dough to give a more rounded shape. 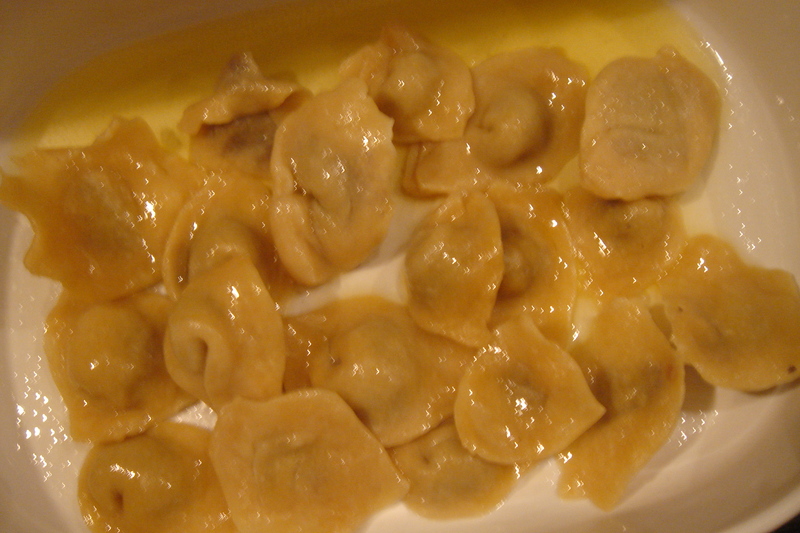 Uszka – means ‘little ears’ and they are much smaller and a different shape than pierogi and are always savoury. They are made from squares of dough, about 4cm square. Half a teaspoon of filling is placed onto the square and then it is folded into a triangle and the edges sealed. The two ends at the folded side of the triangle are brought together and then pinched together giving a shape which is slightly rounded triangle with a pointed part, looking like a little ear. 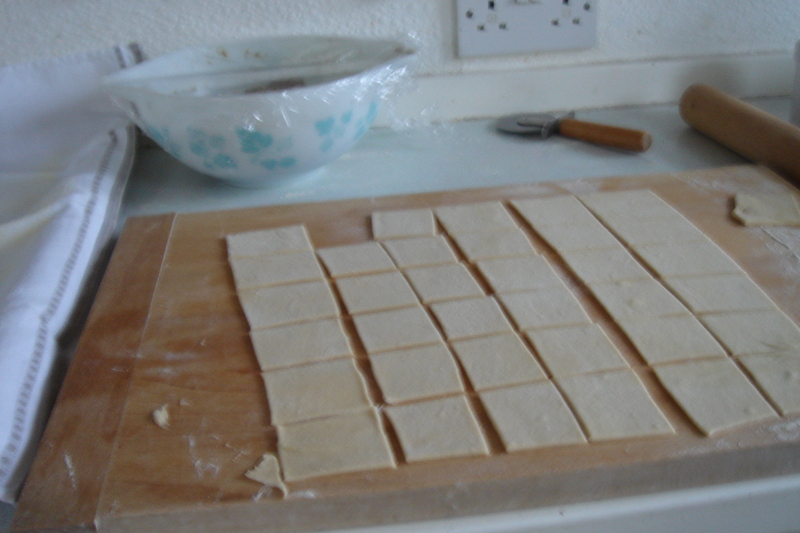 When you have rolled out the dough until it is thin you cut the dough into squares no more than 4cm square. I used to use a sharp knife but have now found that using a pizza wheel to cut the dough is much easier. 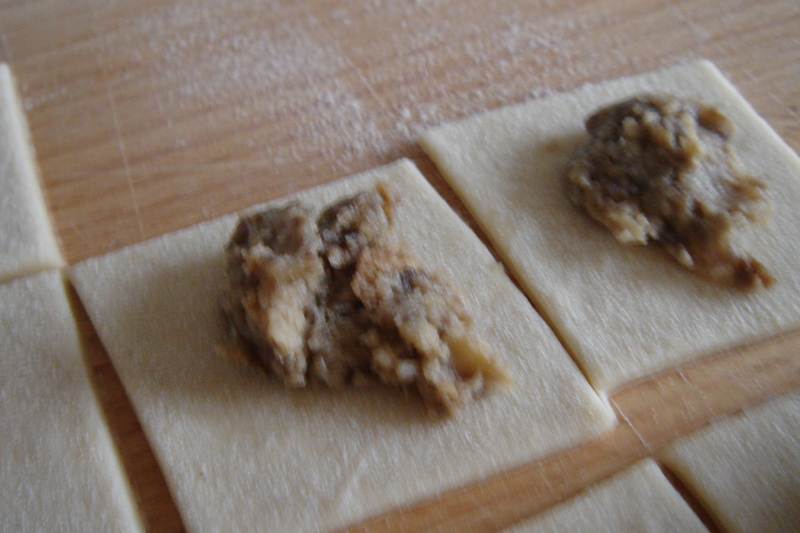 There is little waste dough with each rolling but you can still use all the scrapes to make one last batch. 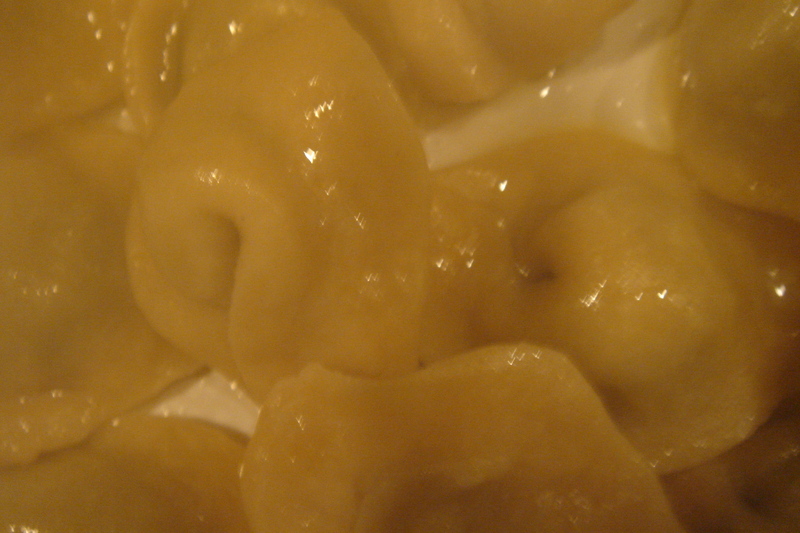 The uszka are boiled in just the same way as pierogi, they are usually ready when they float to the surface. The most traditional fillings are mushroom – see below – and Sauerkraut & Mushroom. Uszka can be served just as pierogi with melted butter or they can be served floating in a clear soup such as rosól – clear chicken soup or in barszcz – beetroot soup. Traditionally mushroom uszka are made for Wigila – the Christmas Eve meal either on their own with butter or served floating in barszcz (clear beetroot soup). You can remove the stalks from the older fresh mushrooms as these tend to be ‘woody’ and then cut them into thin slices. Fry the mushrooms and onions together in the butter. It does depend on the mushrooms and the way they are fried as to how much liquid is produced, if you get a lot, then let them simmer gently to evaporate as much as possible or strain some of this excess off (you can use this liquor in soups or sauces). 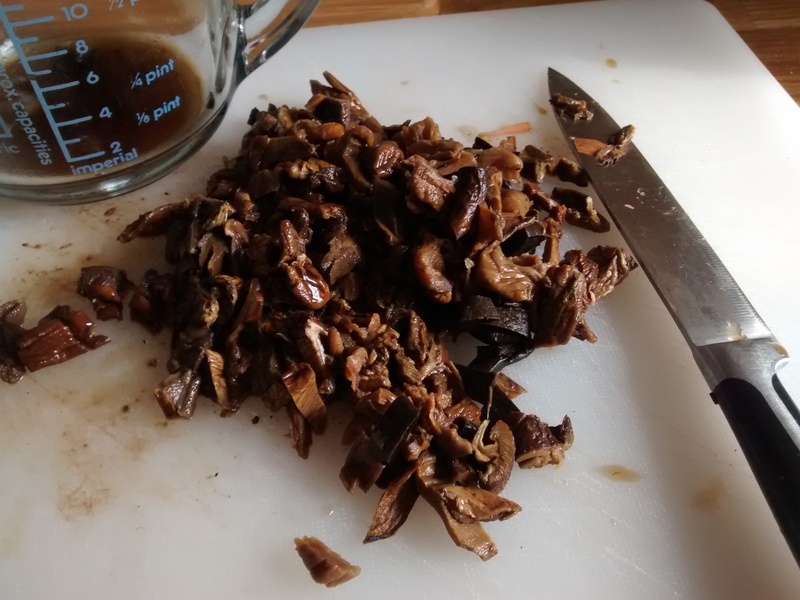 Chop the reconstituted dried mushroom (again you can save the liquor for other recipes) and add these to the mixture. The mixture then needs to be minced which used to take me a long time and much effort. I now use a hand blender which works really well taking care not to liquidise it too much. 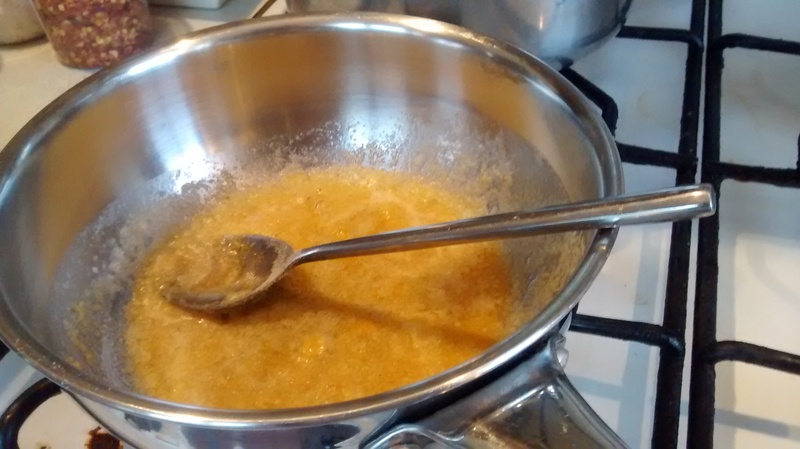 To the minced mixture add the egg yolk and then enough breadcrumbs to make a stiff filling. On a floured board roll out each piece until it is thin. Using a sharp knife or pizza wheel cut the dough into 4cm squares (they can be smaller but they are harder to work). Fold over each piece to form a triangle and pinch the edges together with your fingers. Half a teaspoon of filling is placed onto the square and then it is folded into a triangle and the edges sealed. The two ends at the folded side of the triangle are brought together and pinched together giving a shape which is slightly rounded triangle with a pointed part. 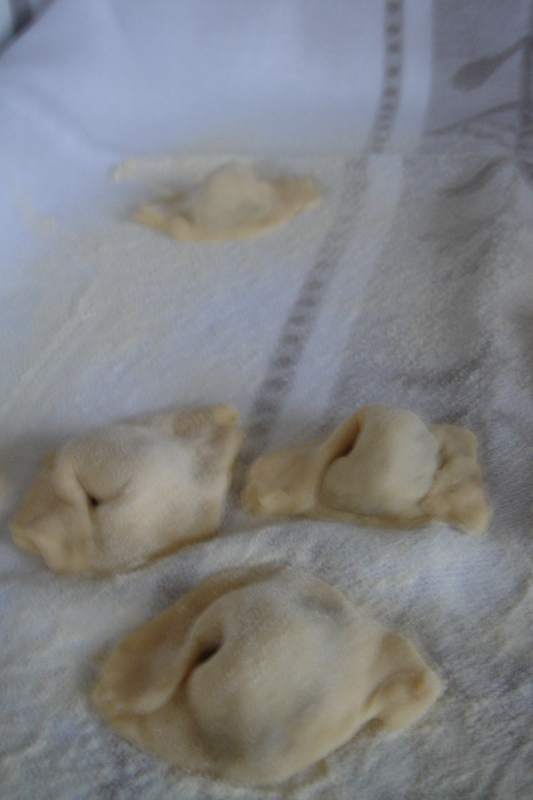 They are cooked just as the pierogi in boiling water with the addition of salt and oil. I serve them with melted butter. If you are going to add them to soup do not coat them with butter – 2 to 4 are added to each serving. After the Wigilia meal on Christmas Eve we always leave some uszka for the Christmas Day breakfast and we have fried eggs, grilled bacon with fried uszka – delicious! This must be my longest post as there is so much to say – I have only touched on the fillings that you can use & you can always make up your own. February 2nd is the start of karnawał – carnival and the festivities leading up to the beginning of Lent which starts on Ash Wednesday. During karnawał there is lots of dressing up in costumes such as beggars, chimney sweeps, goats, bears, horses or storks and going from farm to farm or house to house and there the revellers would be given food and drink. The date of Ash Wednesday varies as it is based on the date for Easter which is calculated according to the Paschal full moon. Easter is the first Sunday after the first full moon, after the spring equinox, which is the 21st of March. So the earliest date for Easter is the 22nd of March and the latest date is the 25th of April. Ash Wednesday is six and a half weeks before Easter – calculated as 40 days but the Sundays are not included so it is in fact 46 days before Easter Sunday. Therefore the earliest date for Ash Wednesday is the 4th of February and the latest date is the 10th of March. In a year when Ash Wednesday is very early – I am sure that karnawał festivities would begin a little early! After Christmas with all the wonderful food it seems like only a few days and it is time to prepare for Lent. All the rich food is used up before Lent, especially on the last day before Ash Wednesday. 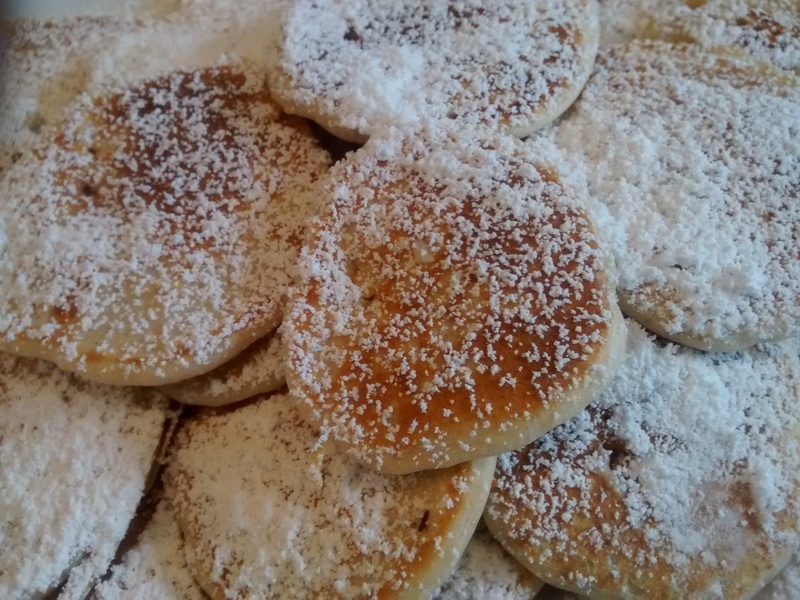 In England it is Shrove Tuesday, in France Mardi Gras(Fat Tuesday), in Poland tłusty wtorek (Fat Tuesday) and in some parts of Poland there is also tłusty czwartek (Fat Thursday) and then the last Tuesday can also be be called ostatki (last remnants). My mother always made chrusty, doughnuts we got from other Polish ladies in the neighbourhood. Chrusty are deep fat fried, sugar dusted pastries. These must be my favourite pastries which my mother would only make once or twice a year before Lent began. When I was little before I started to help, I could never understand how she made these amazing shapes. The name chrusty means “dry twigs” which may describe their appearance but not their taste! You could call them ribbon shaped and in some parts of Poland they are called faworki from the French word faveur which means favour as in the coloured ribbons given by ladies to Medieval knights. My aunty in The United States told me that nowadays they are popular there for weddings and other big parties not just during carnival and that Americans call them Angel wings. I remember that my mother always fried these in vegetable oil. During my research I have realised that originally they were fried in lard, and the books say that this makes them very tasty! 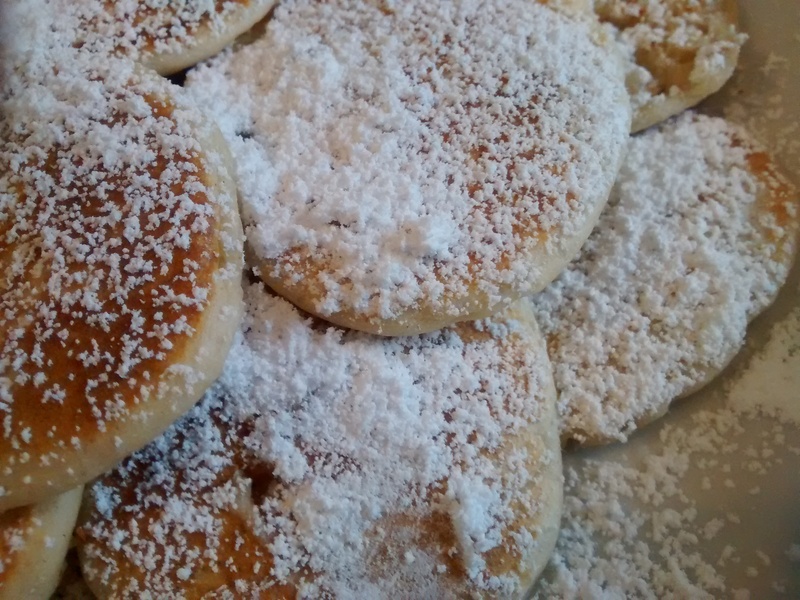 They taste best a few minutes after cooking, straight from the pan, when still slightly warm and dusted with icing sugar. So being in the kitchen when they are being made is the best place to be! 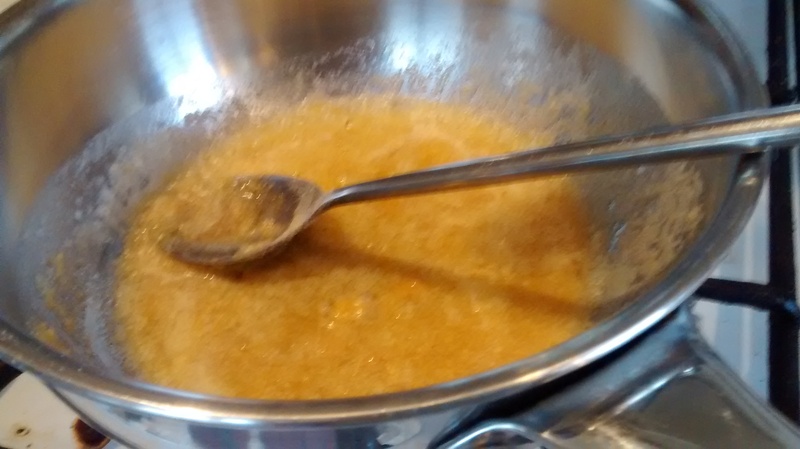 Mix the flours together and rub in the butter to make fine crumbs and then mix in the sugar. Mix together the eggs, yolks and alcohol together. Make the decision on how much cream to use or not as you start to mix later. Make a well in the dry ingredients and add the liquid. Mix the liquid with the dry ingredients to make a soft dough. You can use a knife at first and then your hands. If the dough needs some extra liquid then add the soured cream bit by bit. Take about a third of the dough and roll it out on a floured board as thinly as possible. Using a sharp knife cut strips which are strips 3 to 4 cm wide and about 15cm long, you can cut the short edges diagonally. In each one cut a slit down the middle long ways and pull the short edge through to make a twist. Repeat with the rest of the dough, try to use as much as possible in the first cutting but you can mix and re-roll the off-cuts. Try not to add too much extra flour when re-rolling. You can brush of excess flour with a pastry brush. In a pan or fryer heat up the oil and deep fat fry the chrusty, about 2 or 3 at a time till they are golden. They will rise to the top as they cook, turn them over using bamboo or wooden tongs. 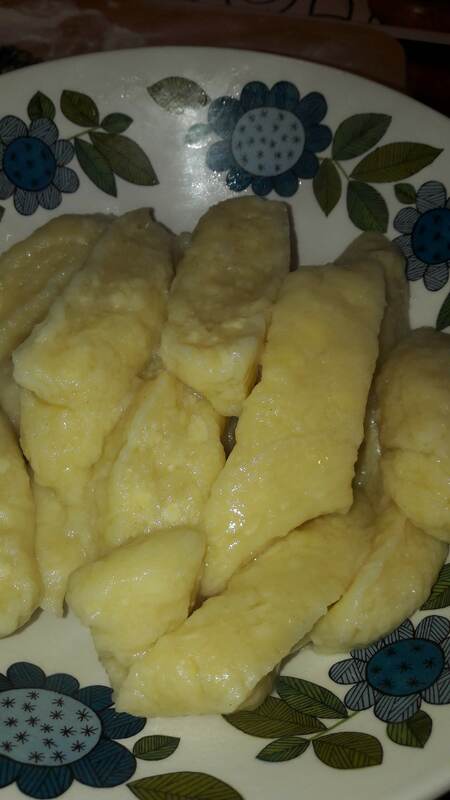 Remove from the hot oil, using the frying basket or bamboo/wooden tongs. Place onto kitchen roll and dust with icing sugar. 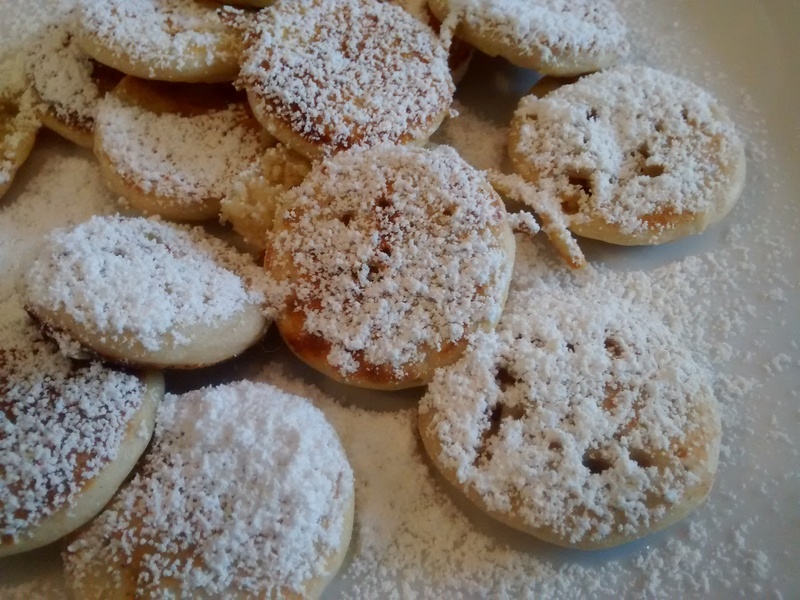 If you have any left put them in an airtight container when they are completely cold and add extra icing sugar when you serve them.